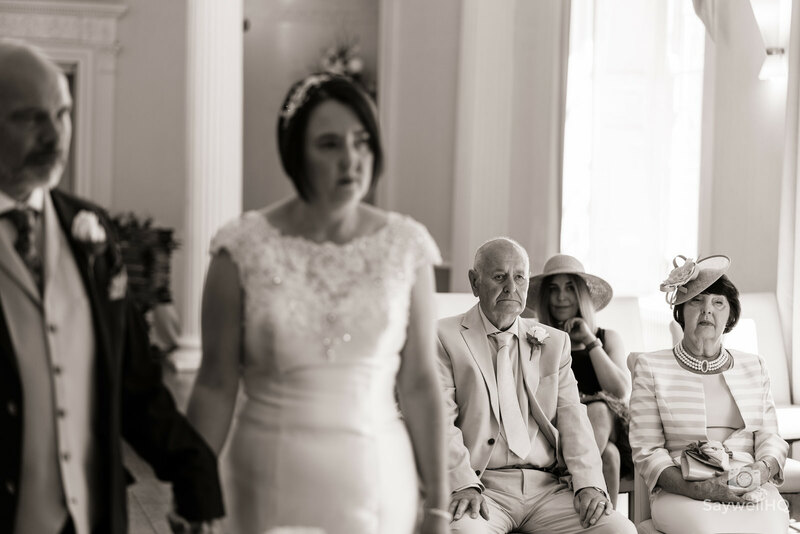 I love small weddings, ones where you know that everybody that is there is only there because they mean something to the bride and groom. 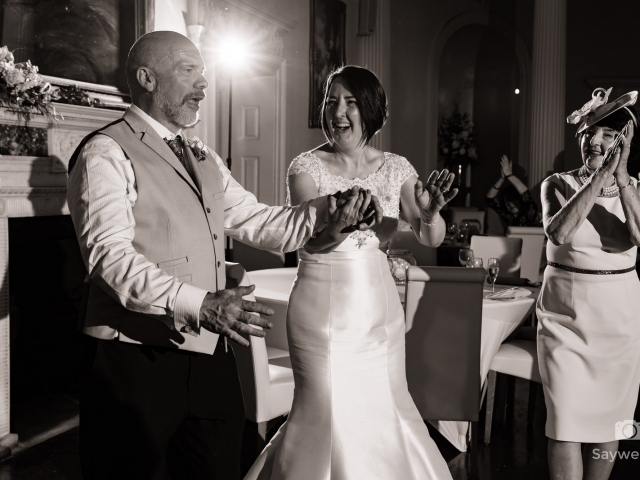 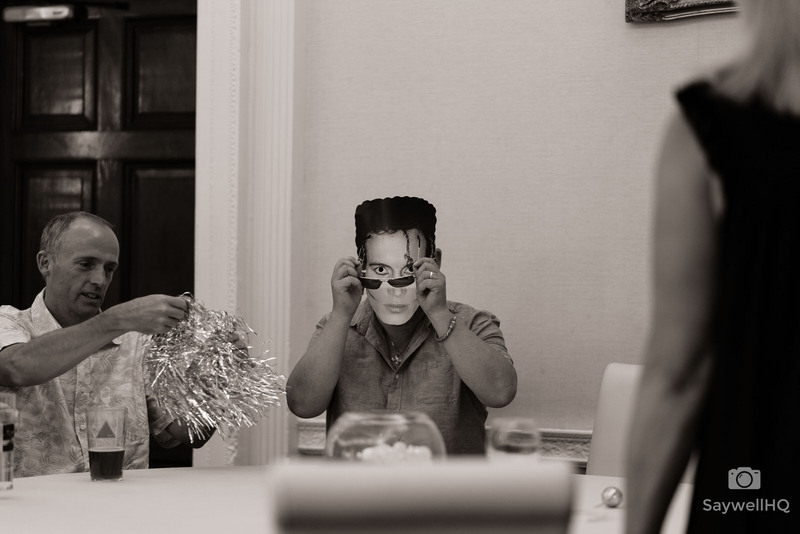 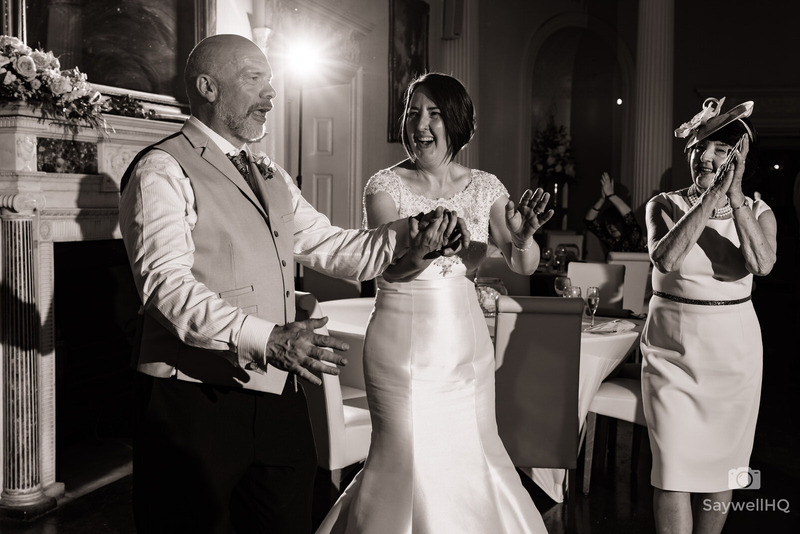 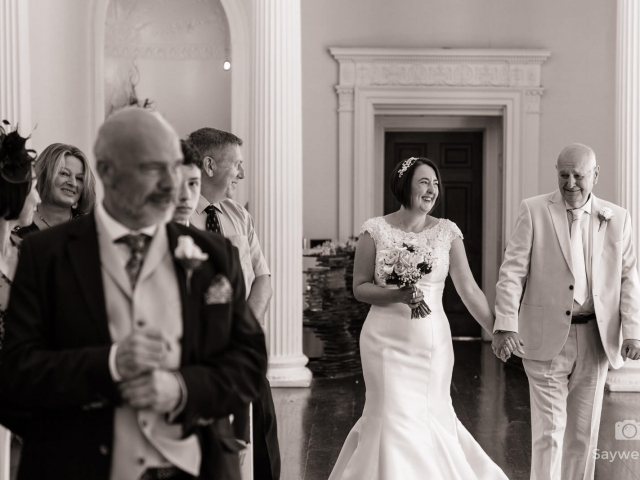 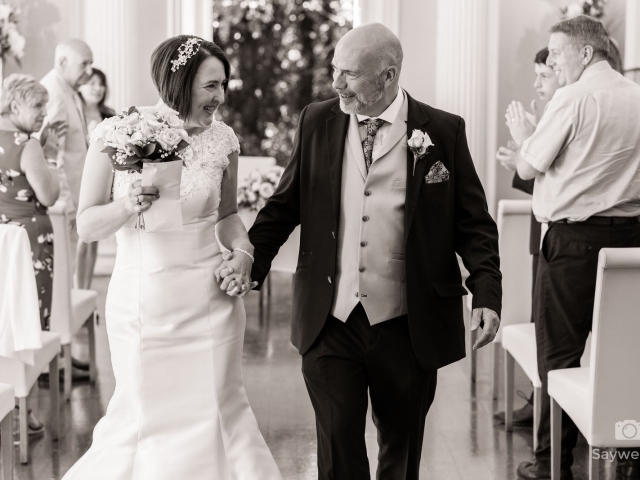 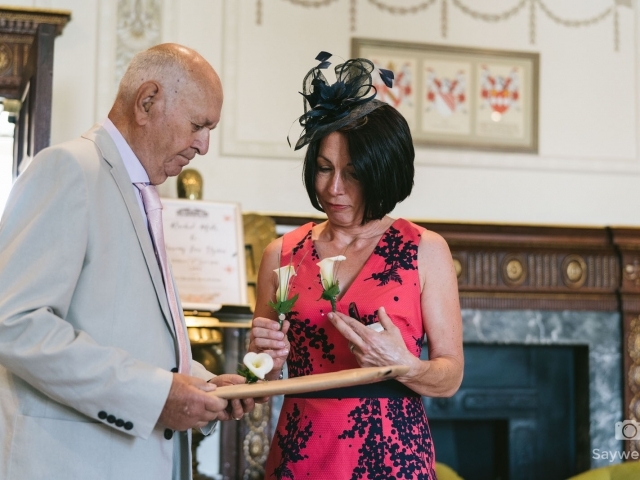 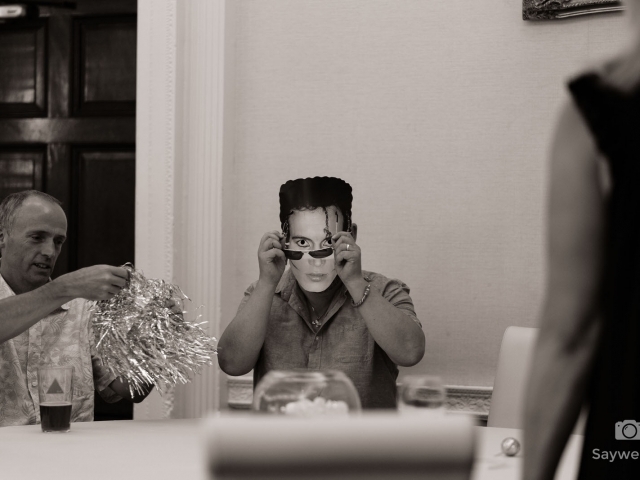 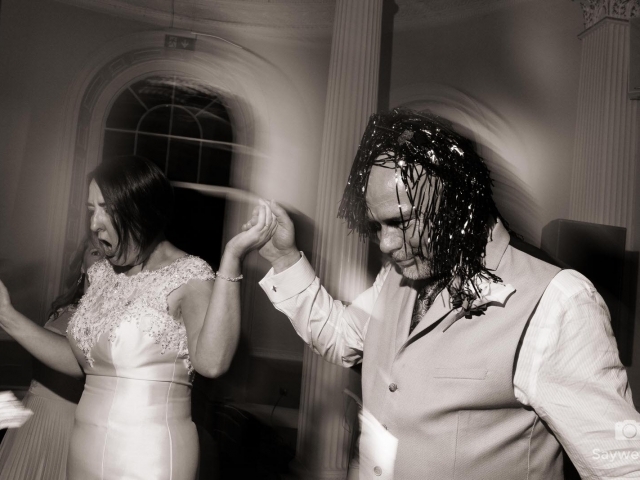 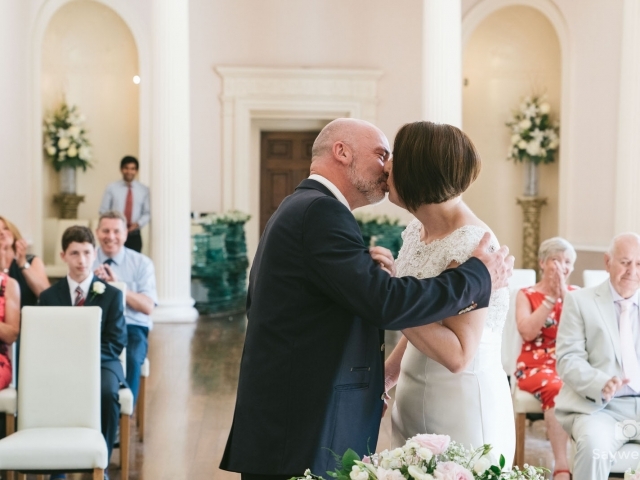 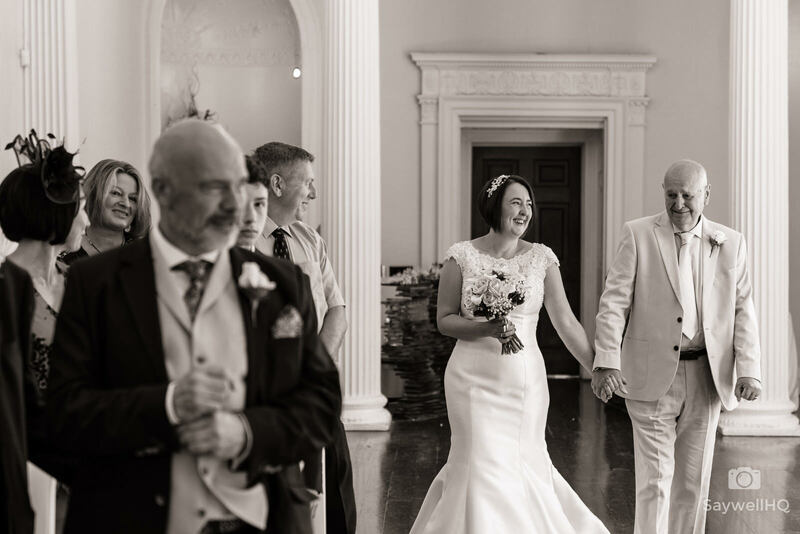 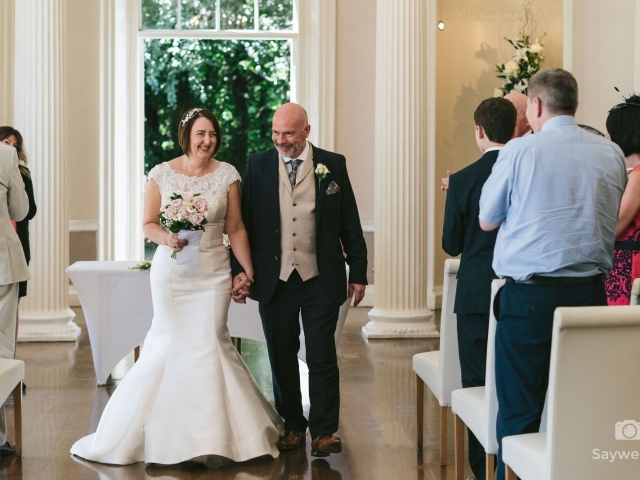 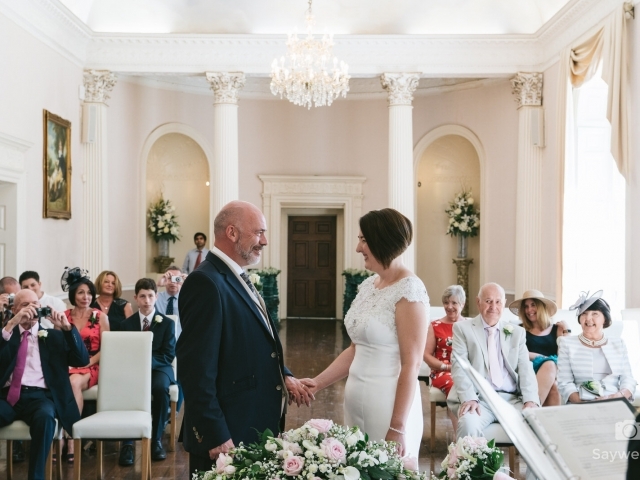 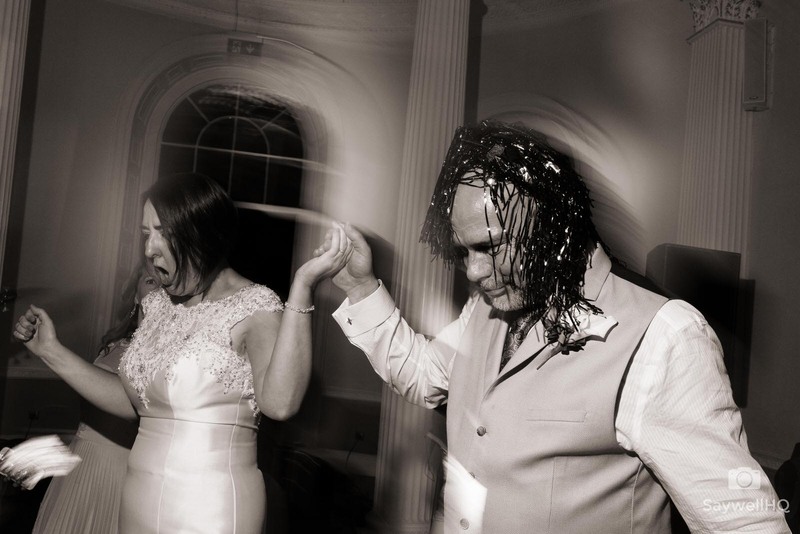 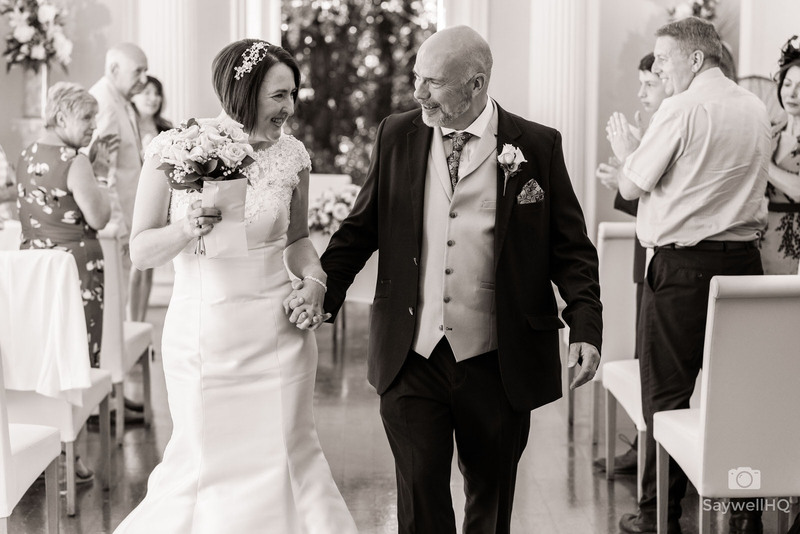 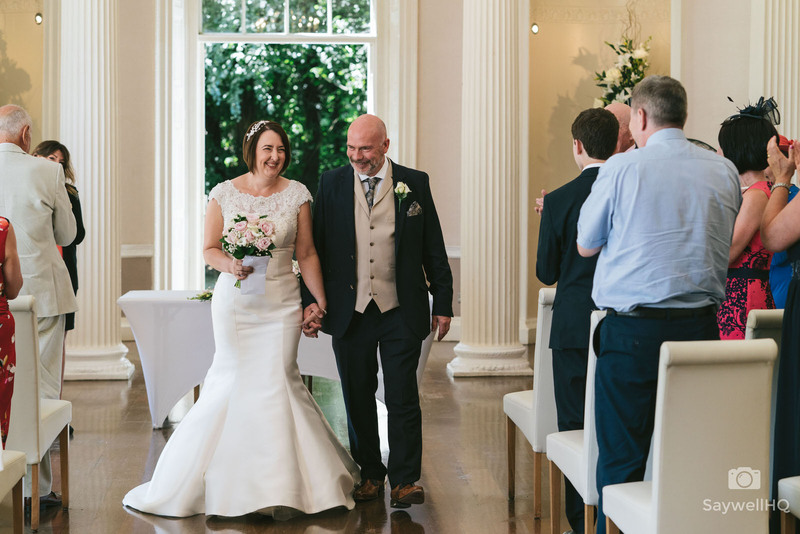 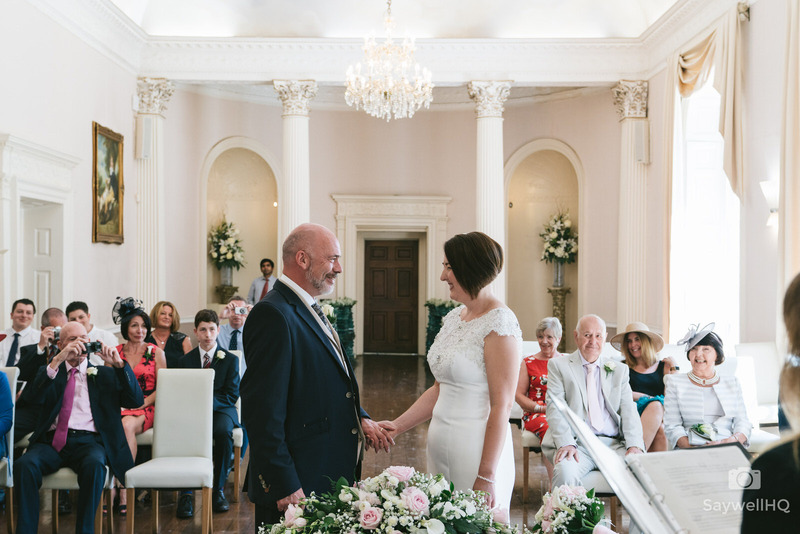 Rachel and Jerry invited only 15 guests to their wedding ceremony which was held at Colwick Hall Hotel in Nottingham. 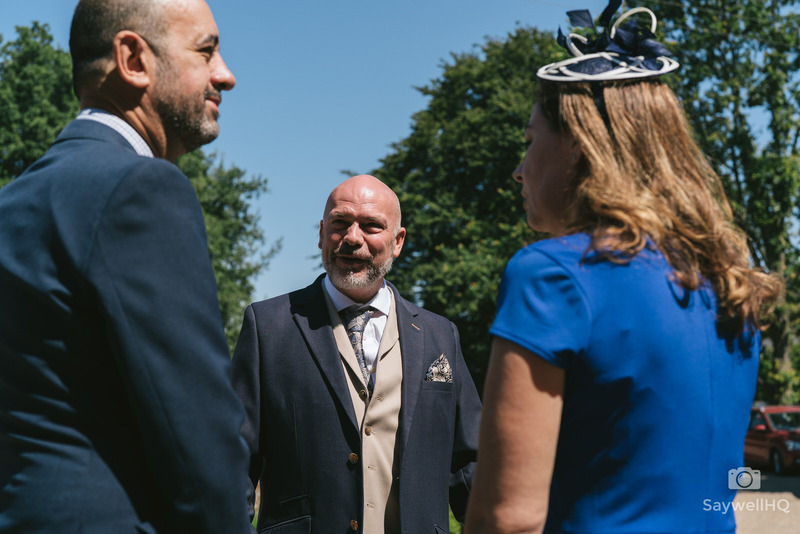 The guys didn’t want much fuss on their wedding day just to spend it with close family and friends and to enjoy the sunshine on what was a very warm day. 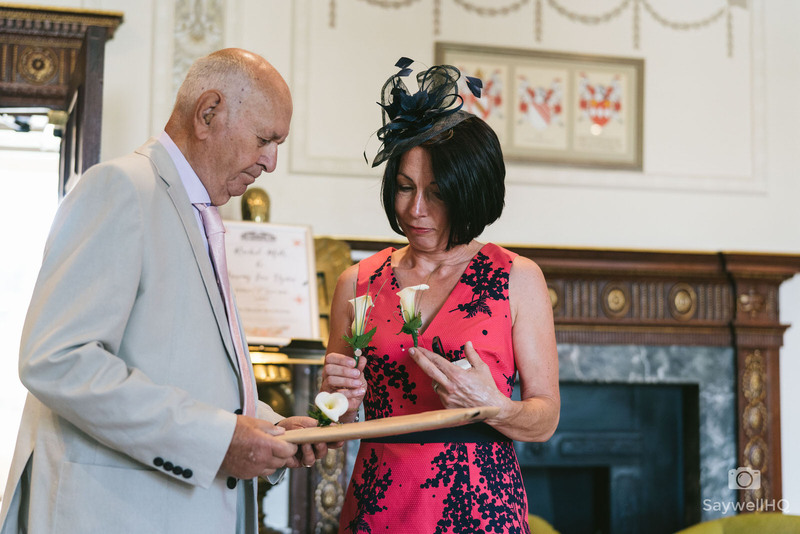 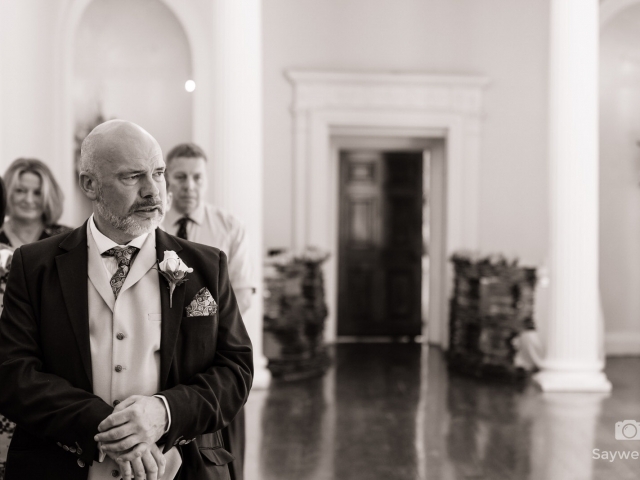 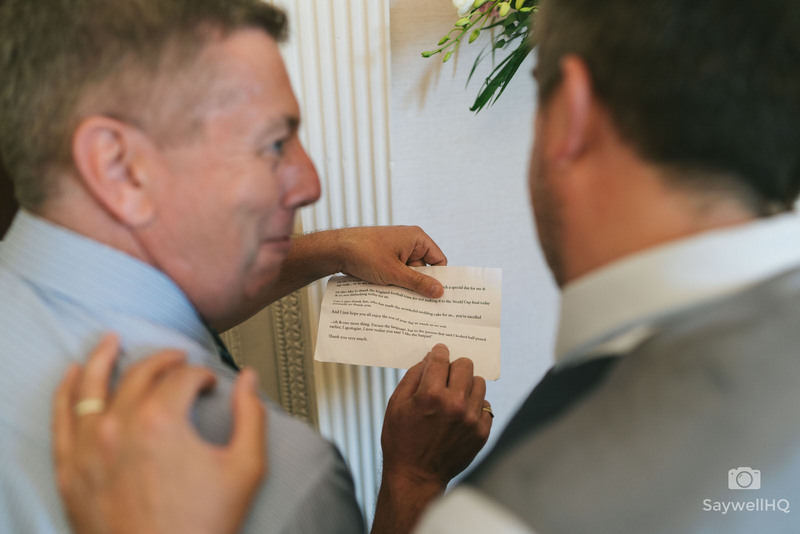 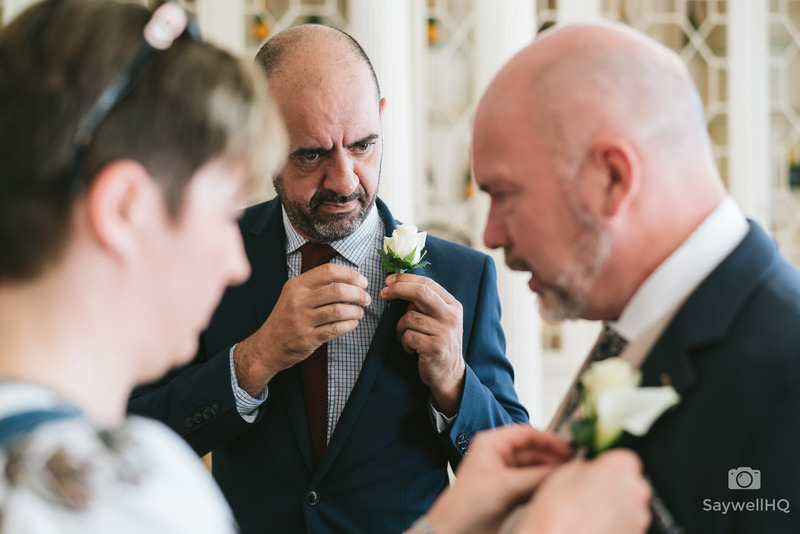 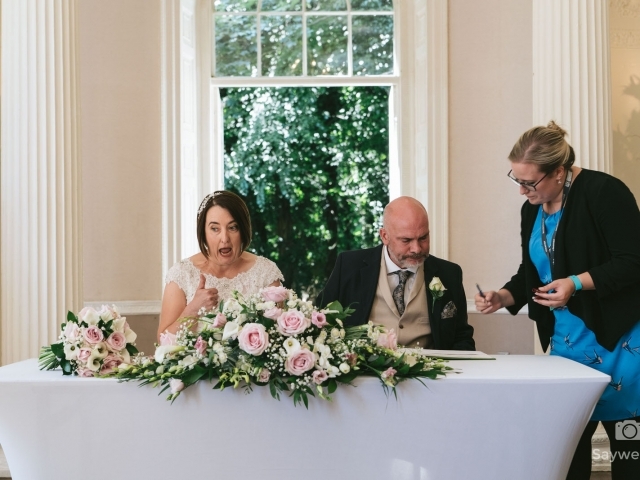 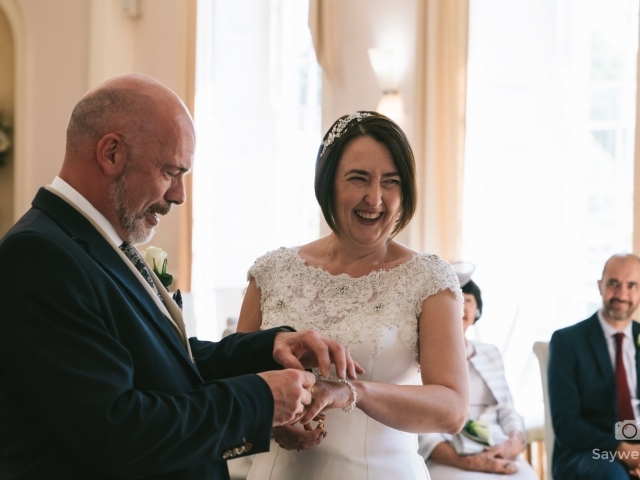 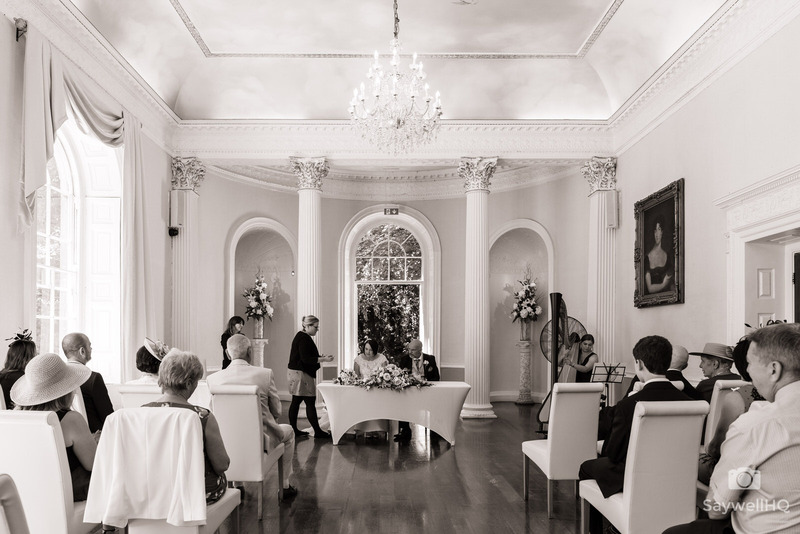 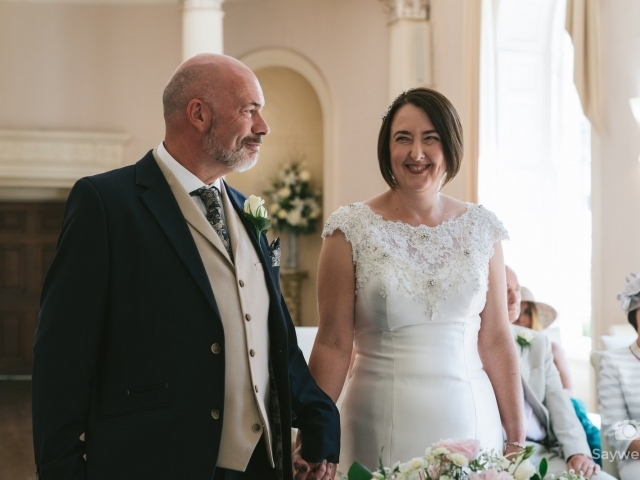 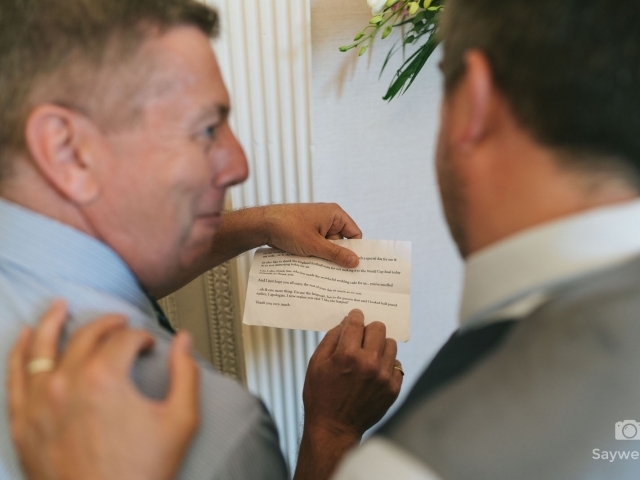 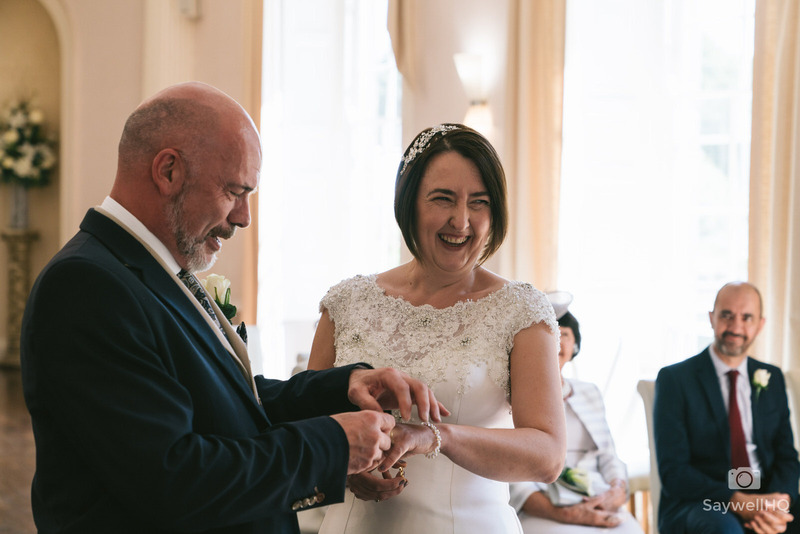 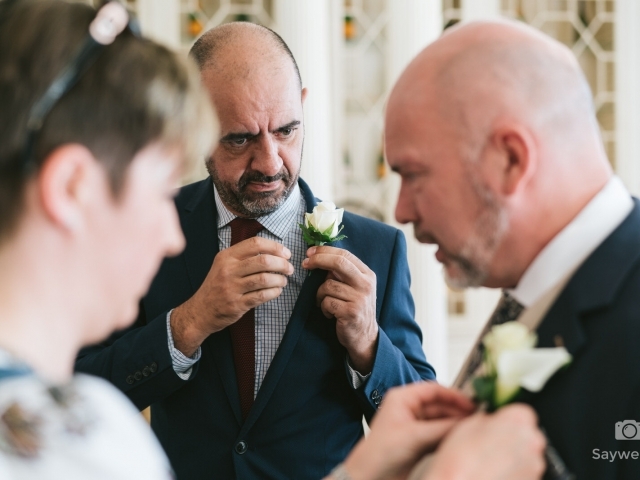 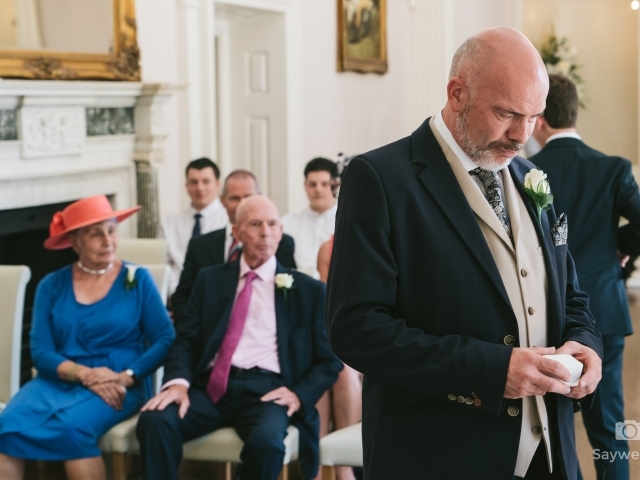 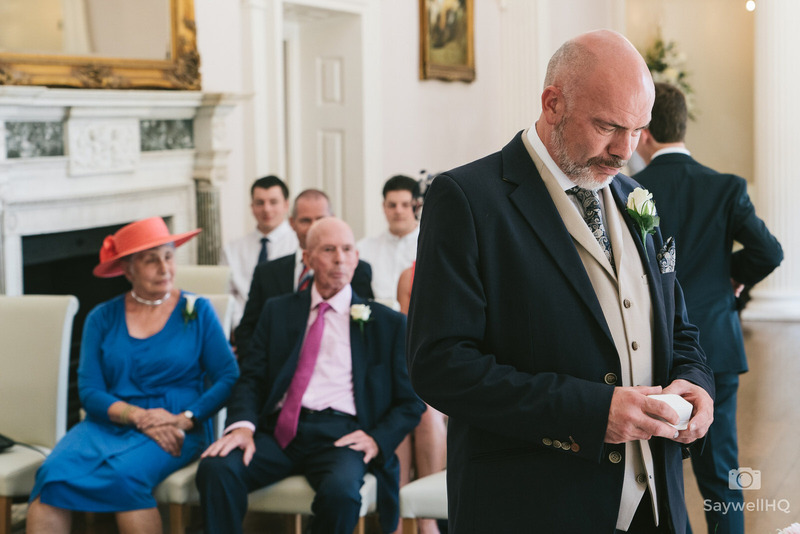 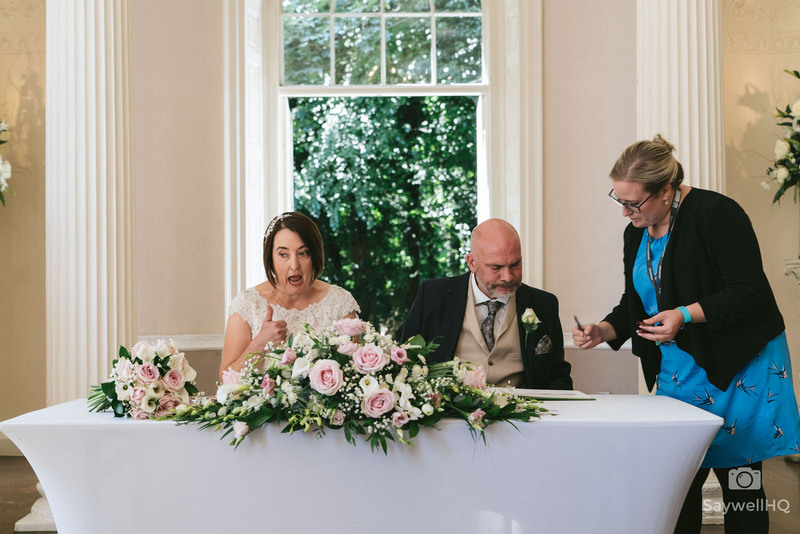 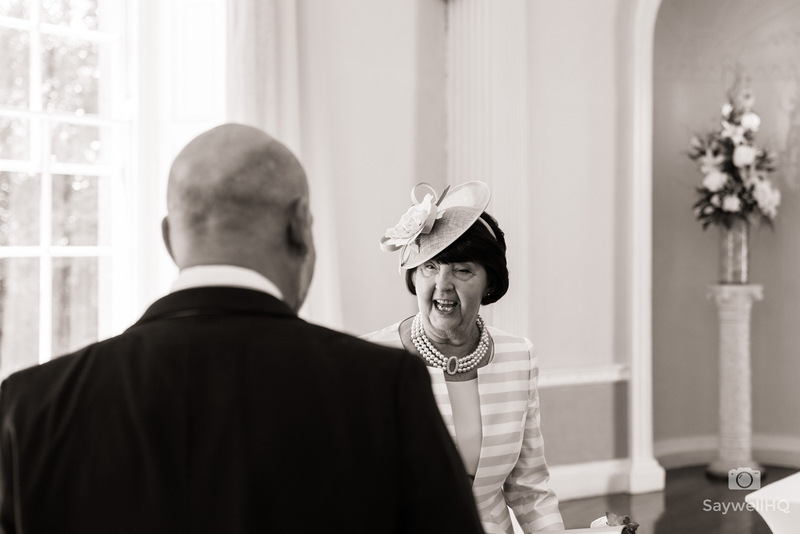 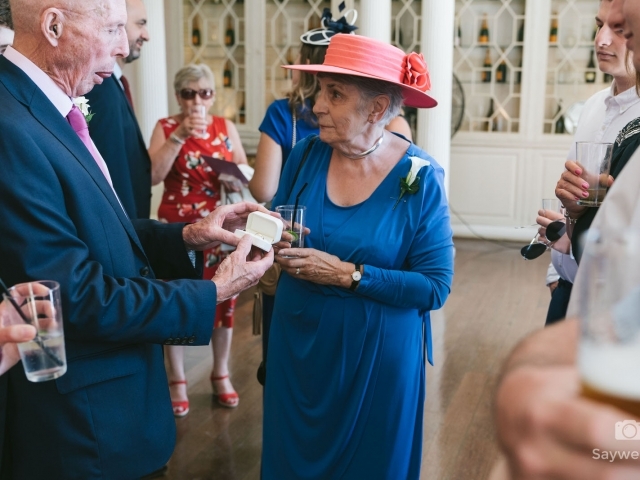 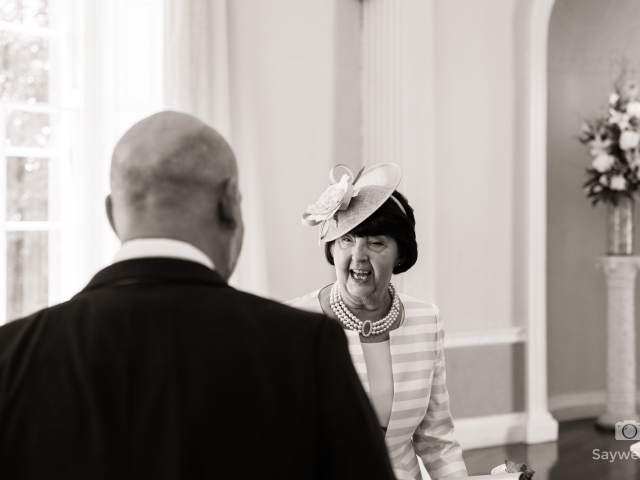 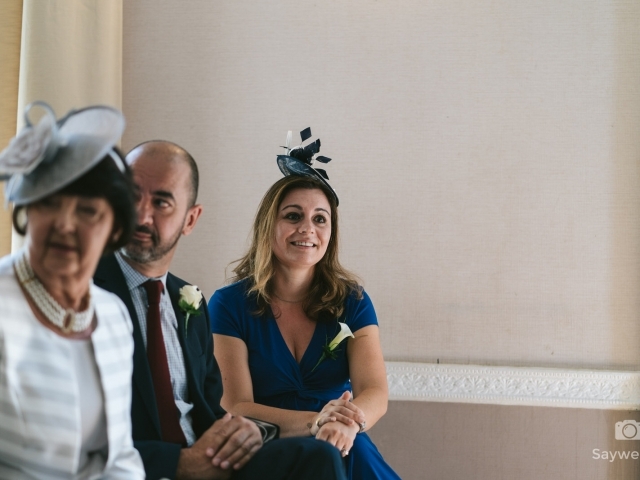 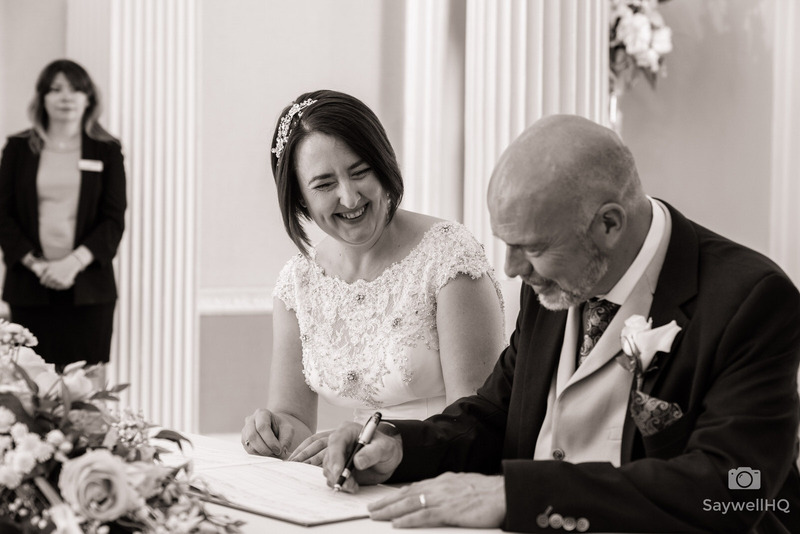 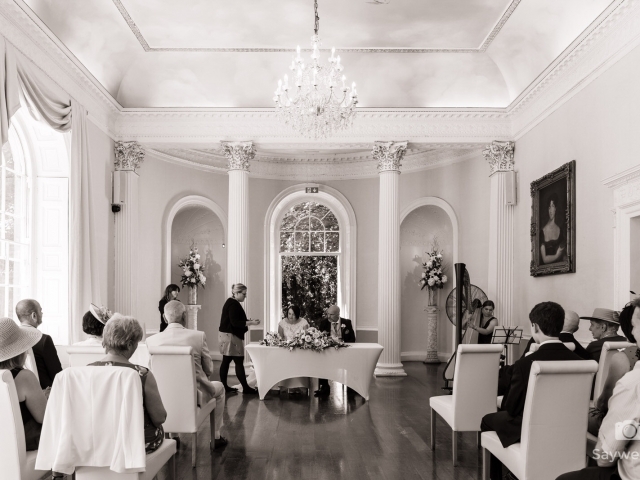 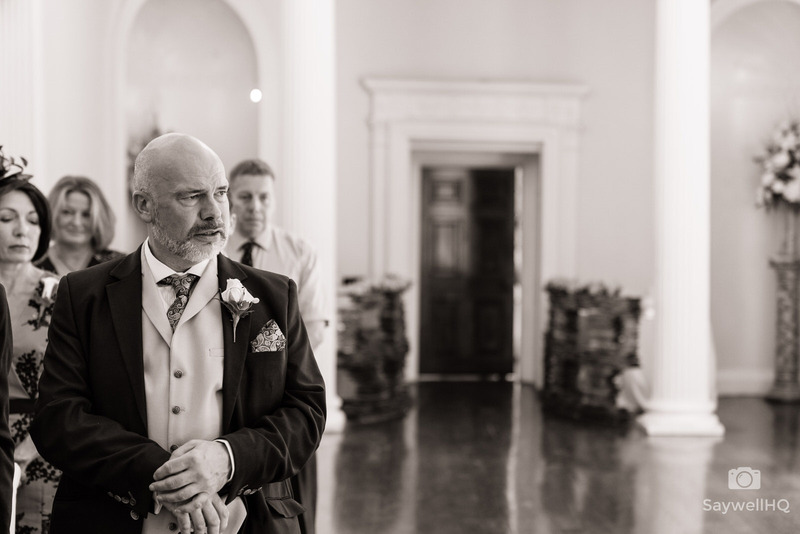 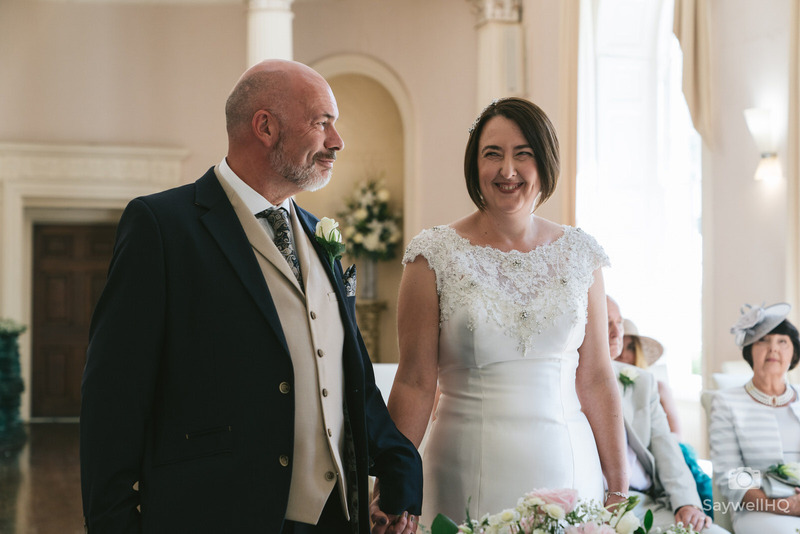 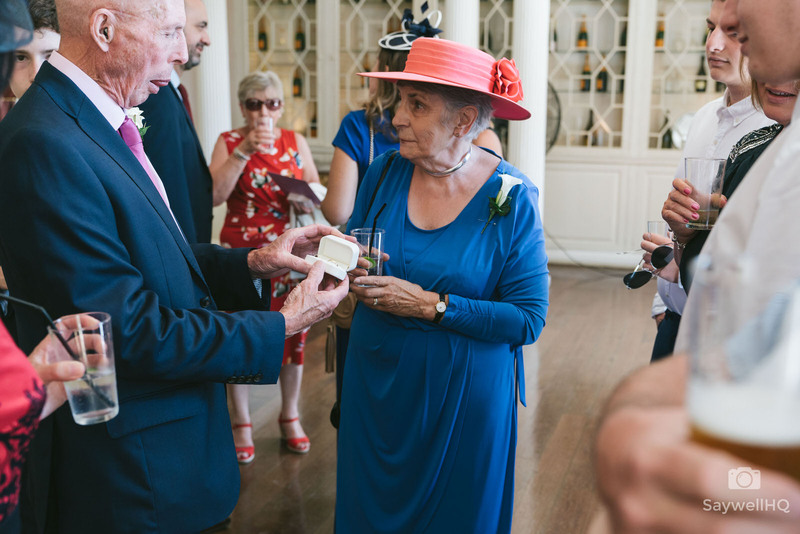 The ceremony itself was over and done within six minutes, which is the quickest one that I’ve done in a very long time – the ceremony was that quick that the registrars hadn’t had a chance to fill out the wedding register by the time the ceremony had finished! 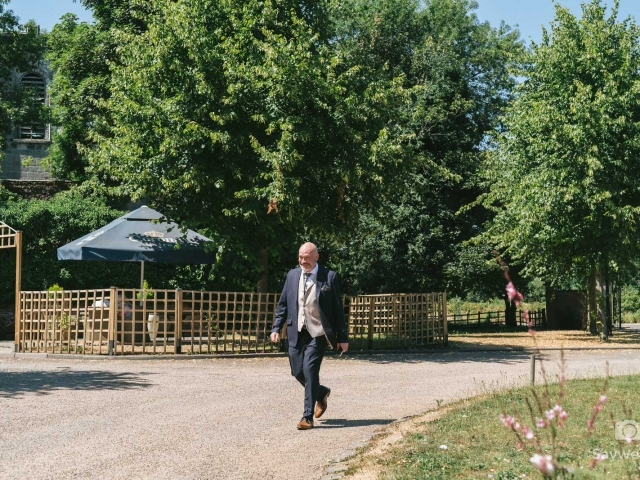 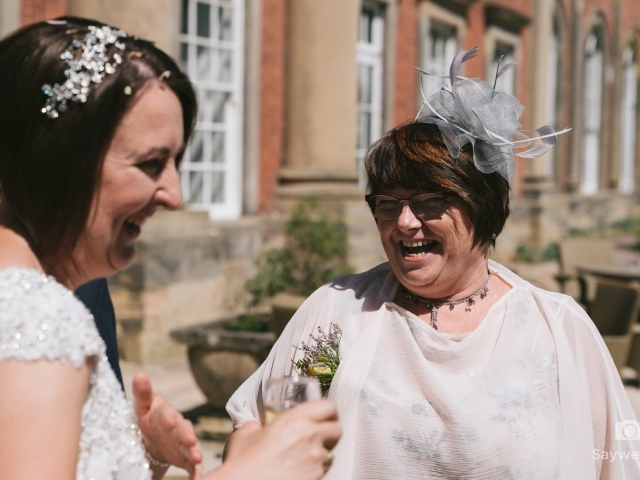 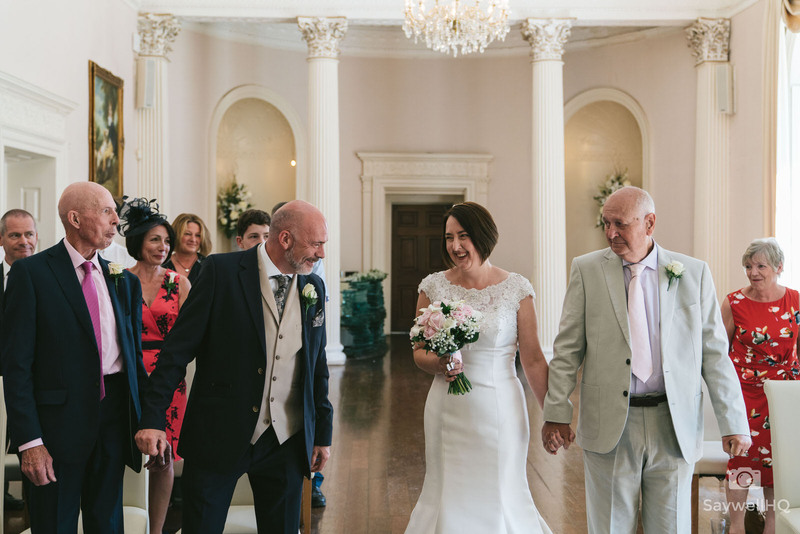 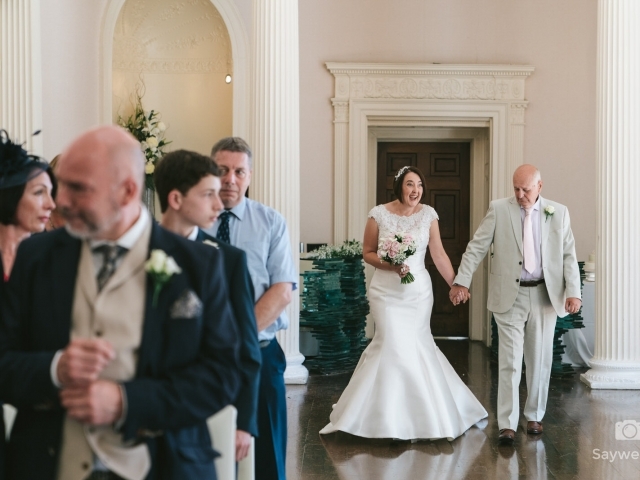 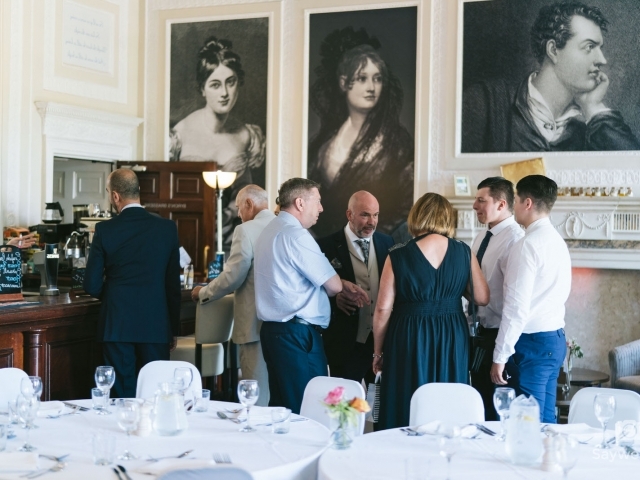 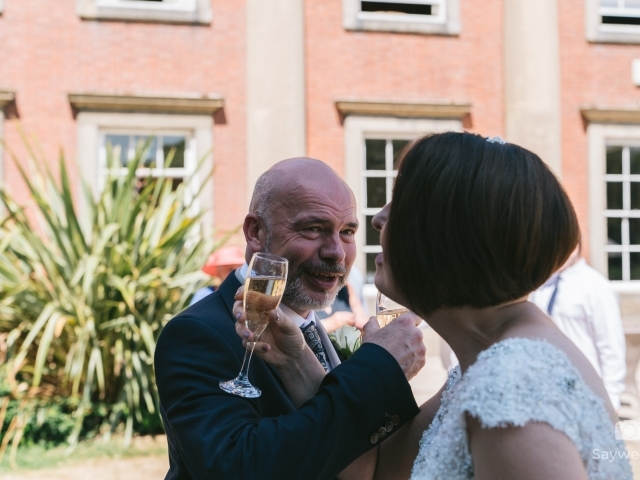 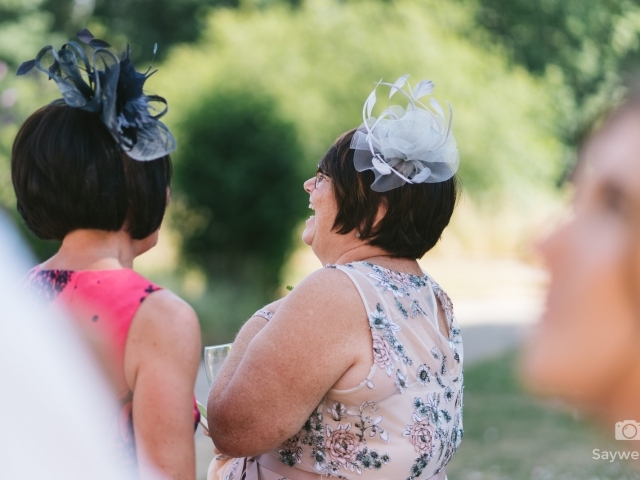 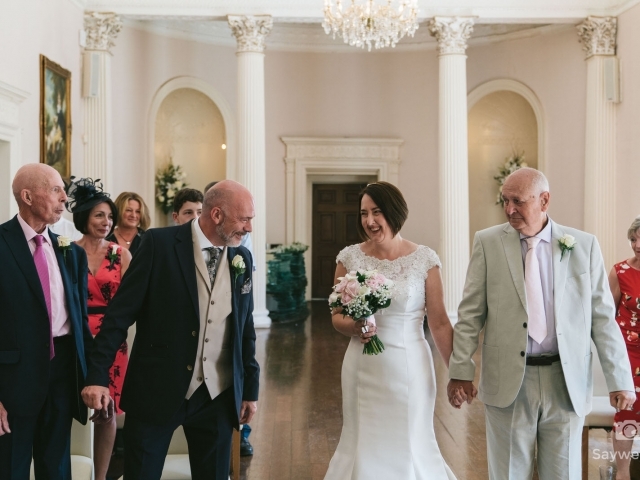 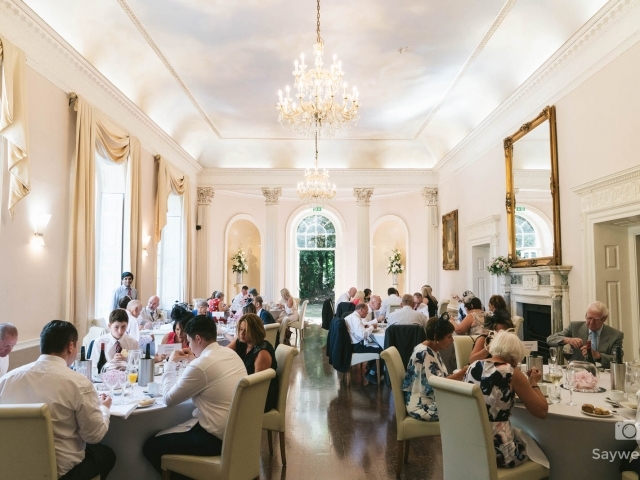 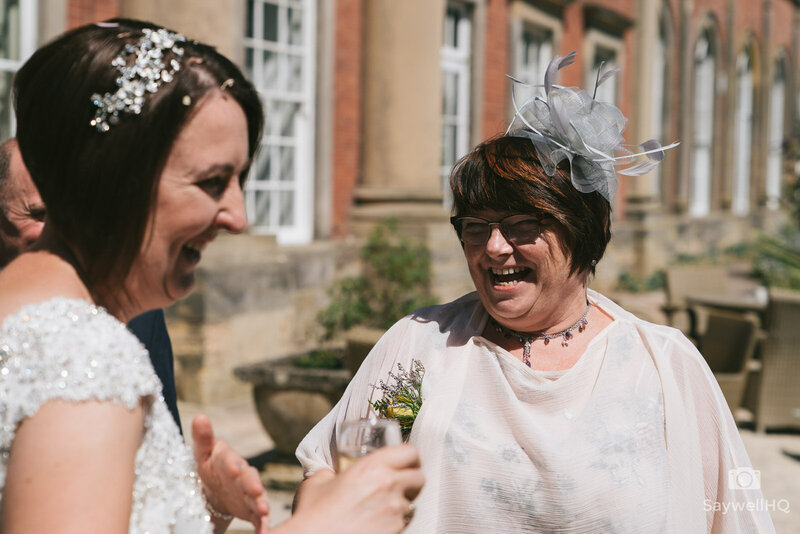 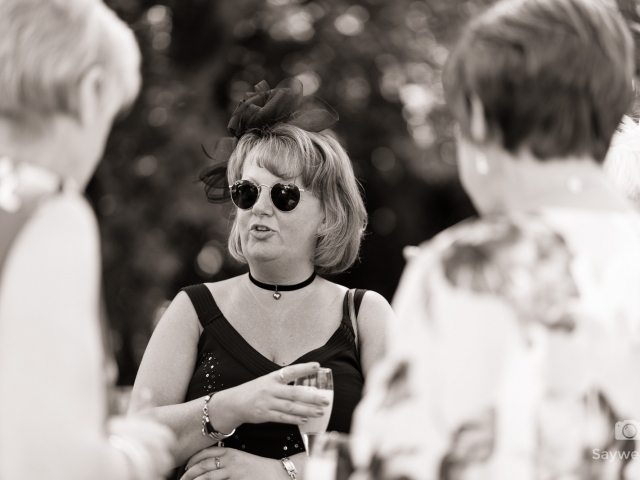 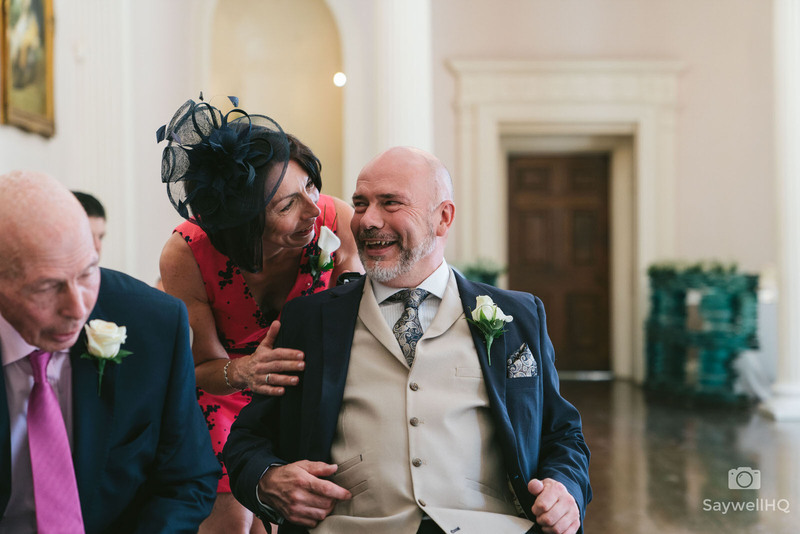 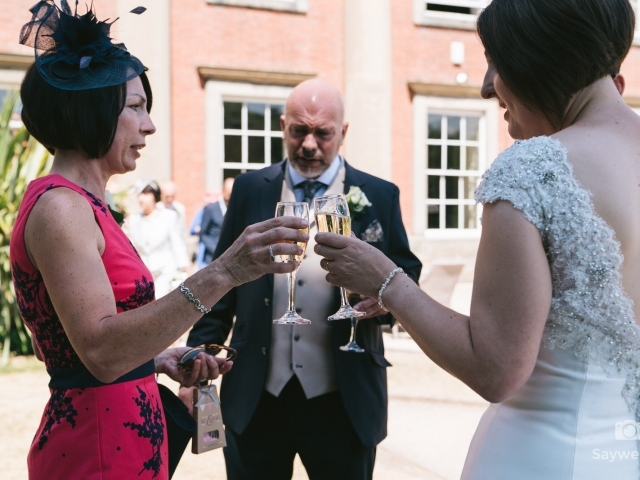 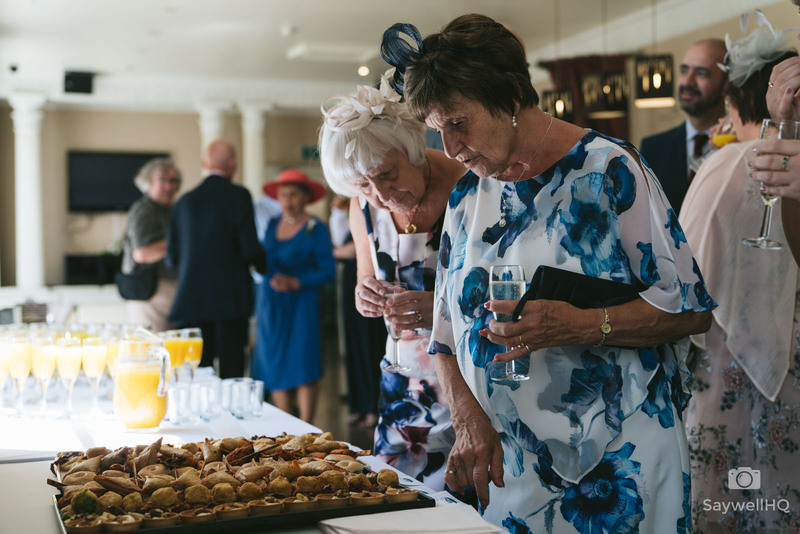 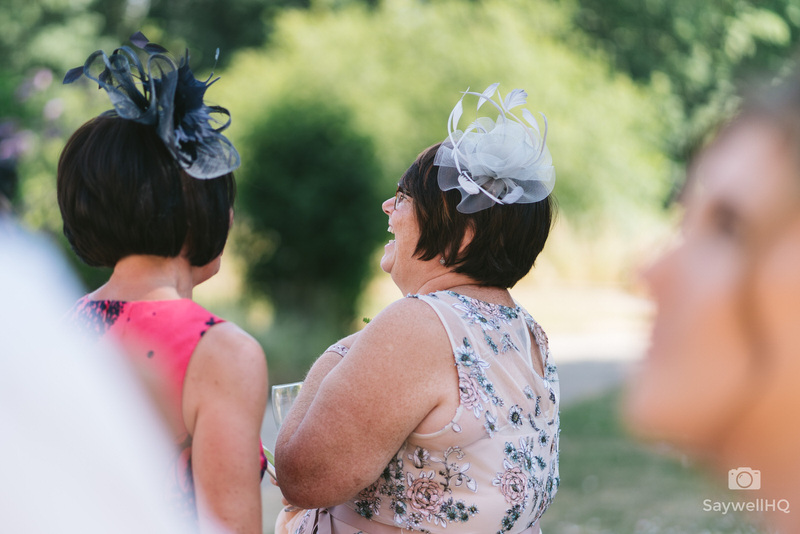 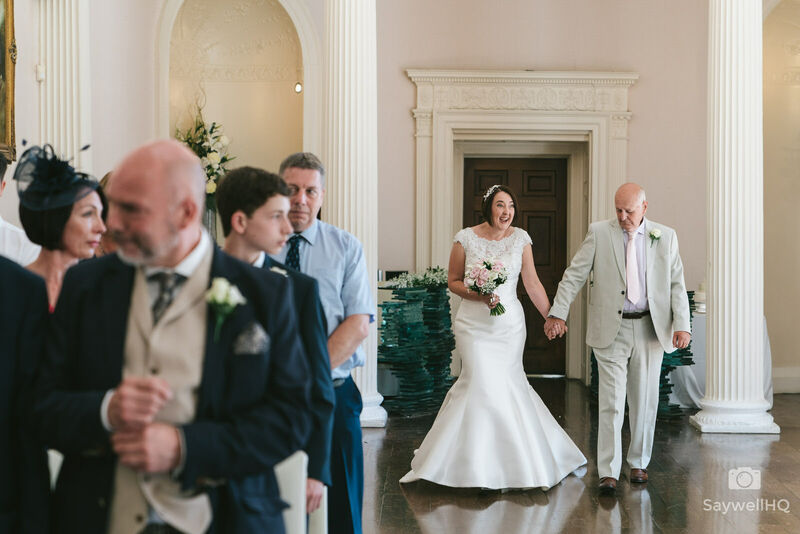 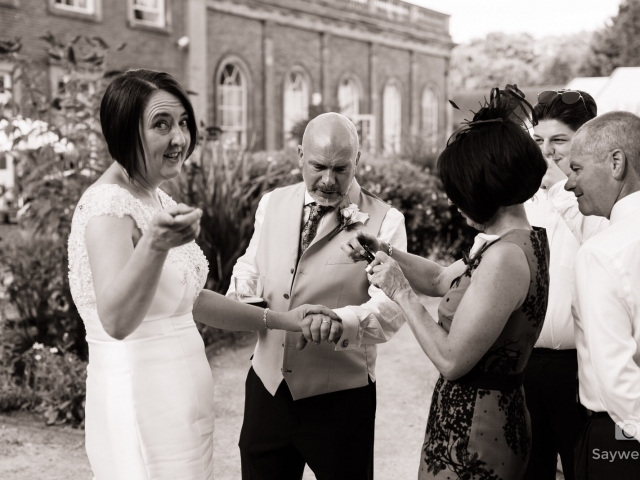 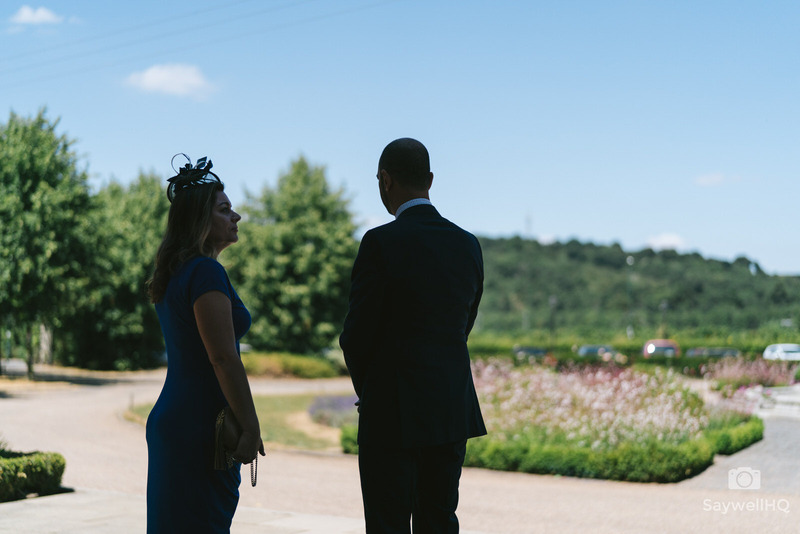 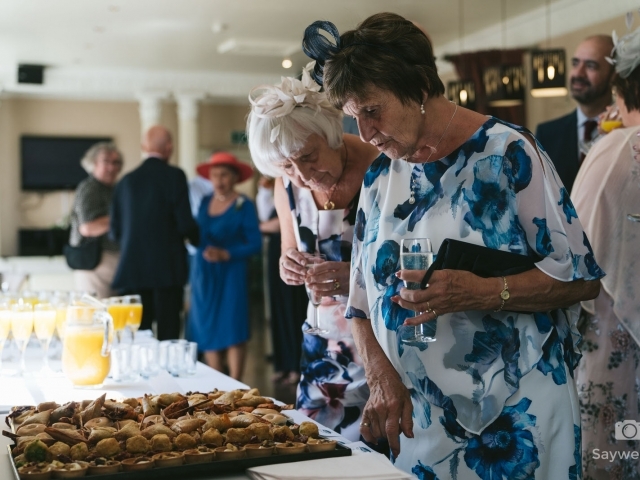 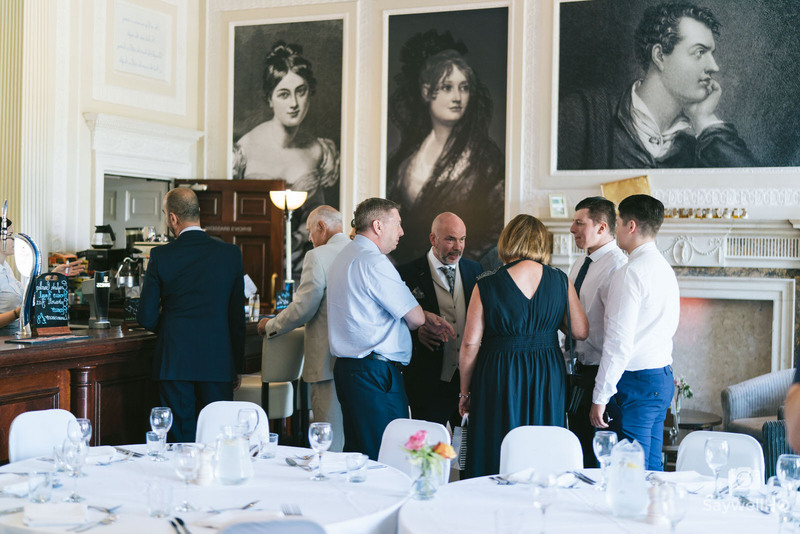 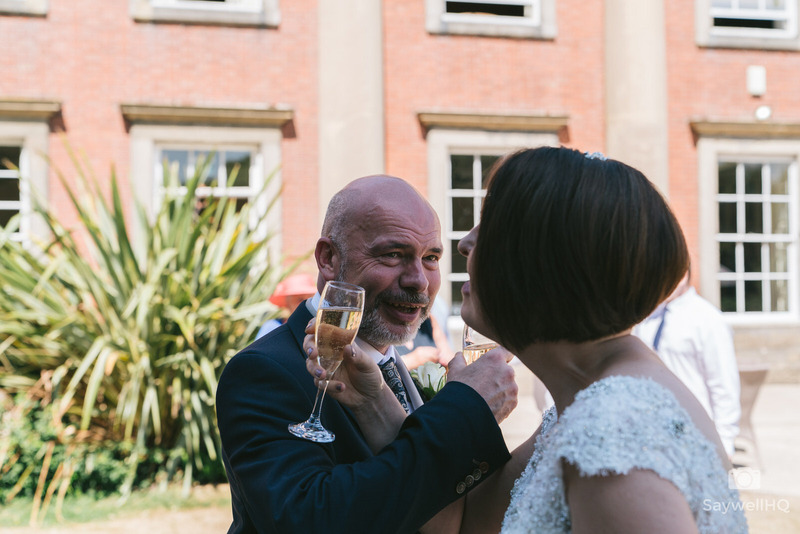 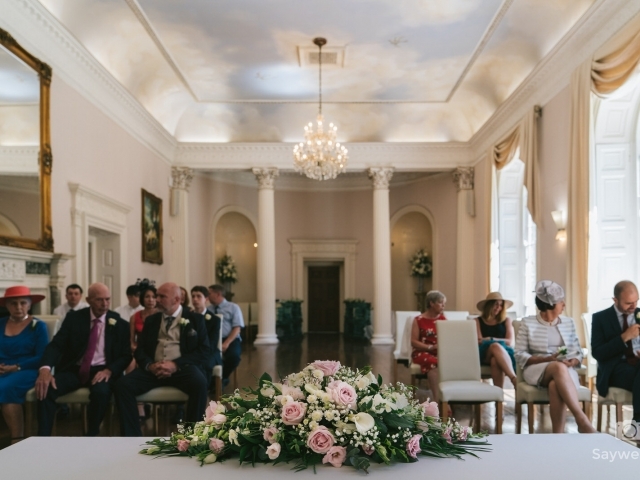 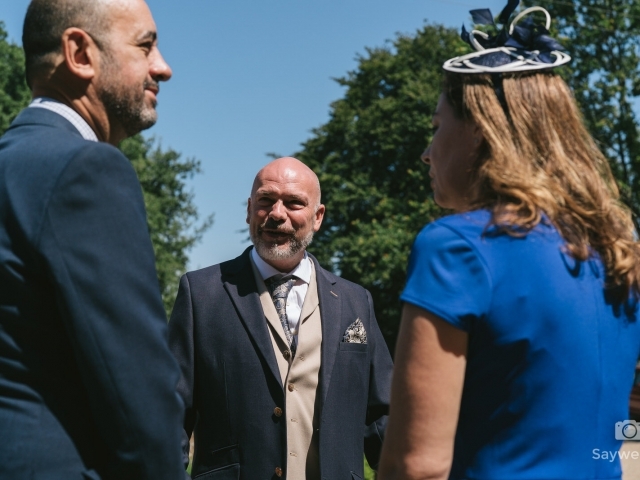 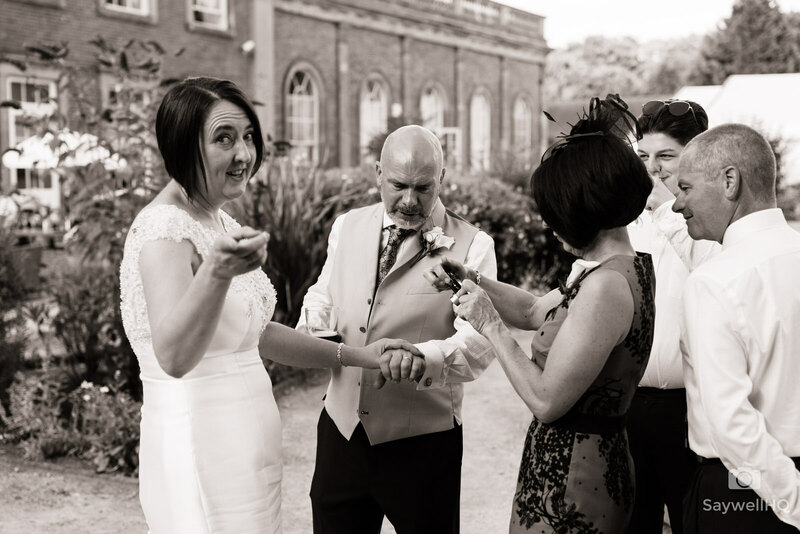 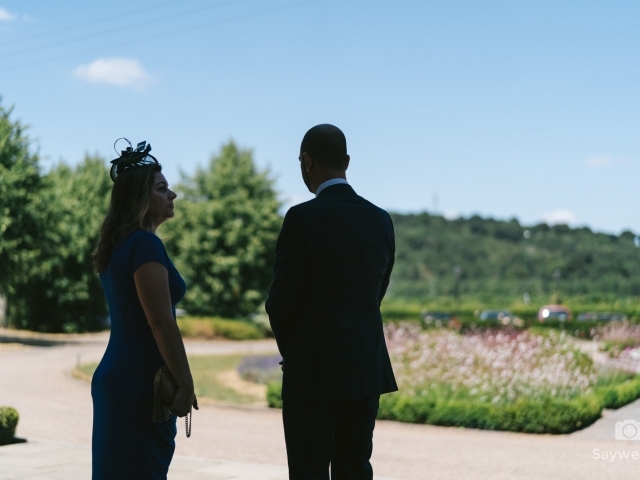 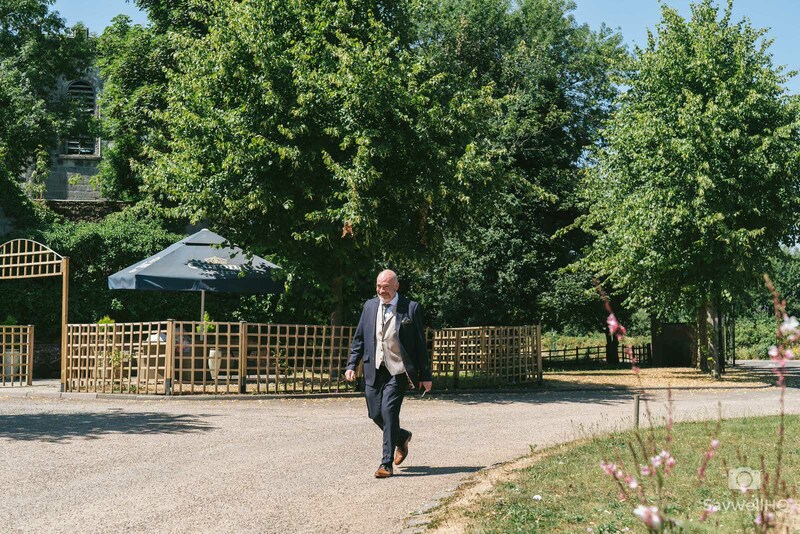 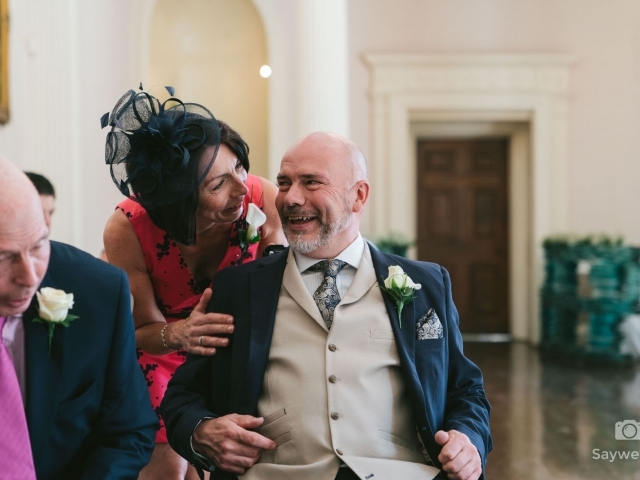 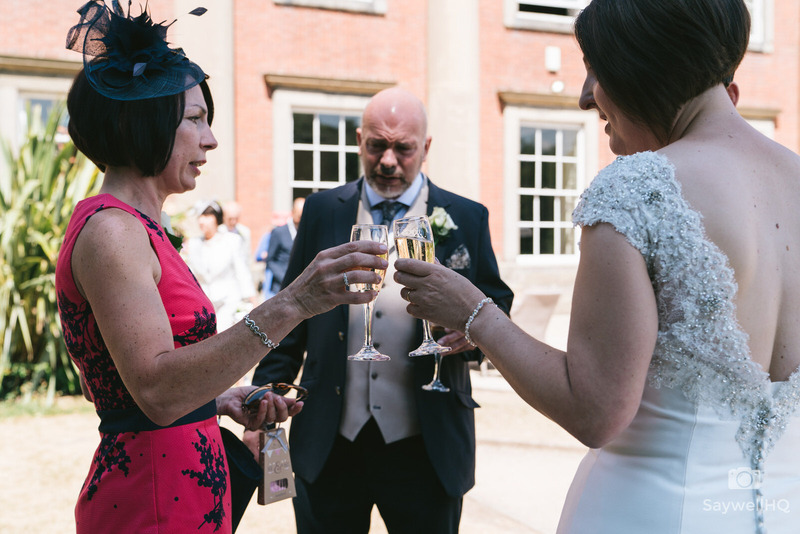 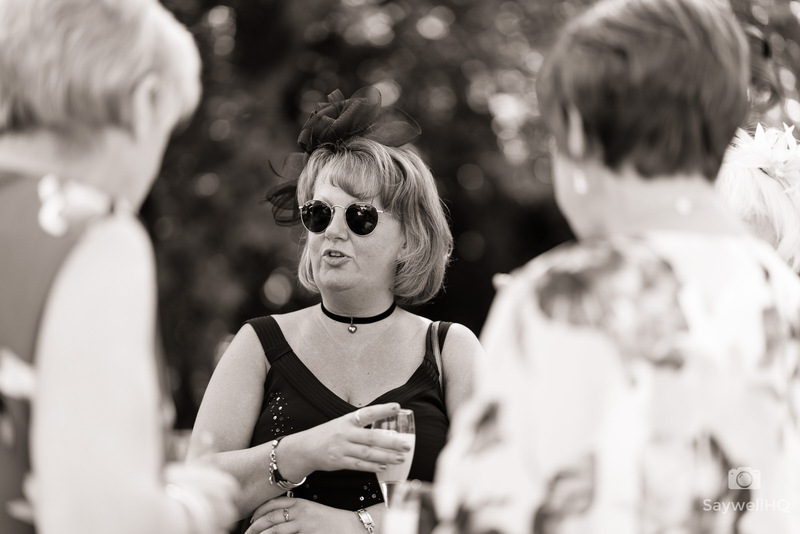 Once the ceremony was done everybody went outside to enjoy the sunshine and the lovely gardens at Colwick Hall and by this time further guests had arrived for the wedding breakfast. 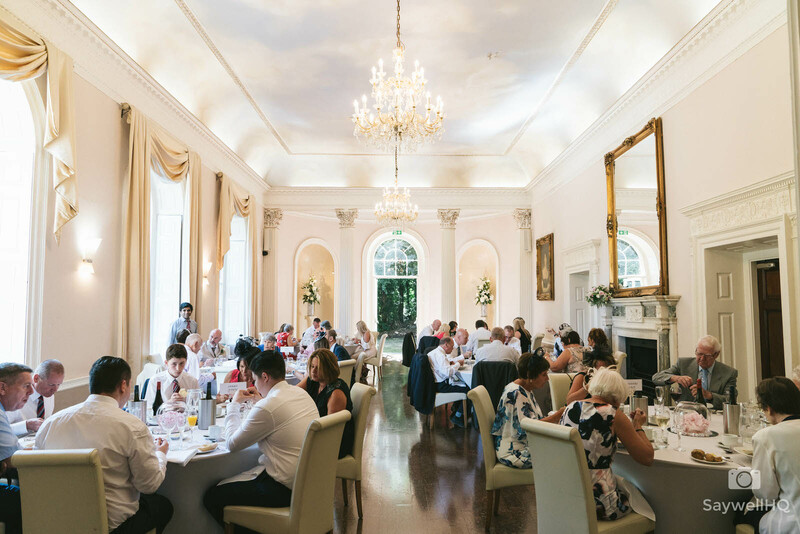 The ceremony room was quickly turned around ready for the wedding breakfast, no big speeches by Jerry or Rachel just a lovely toast from Rachel’s brother. 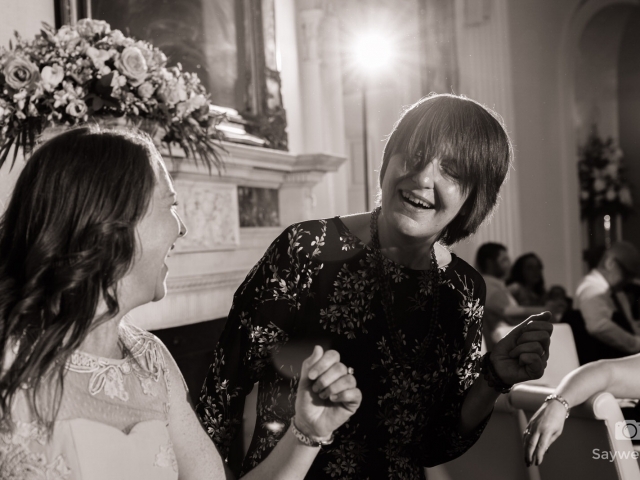 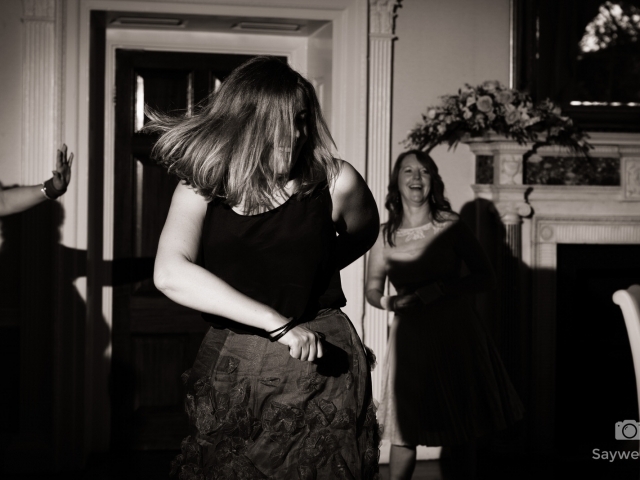 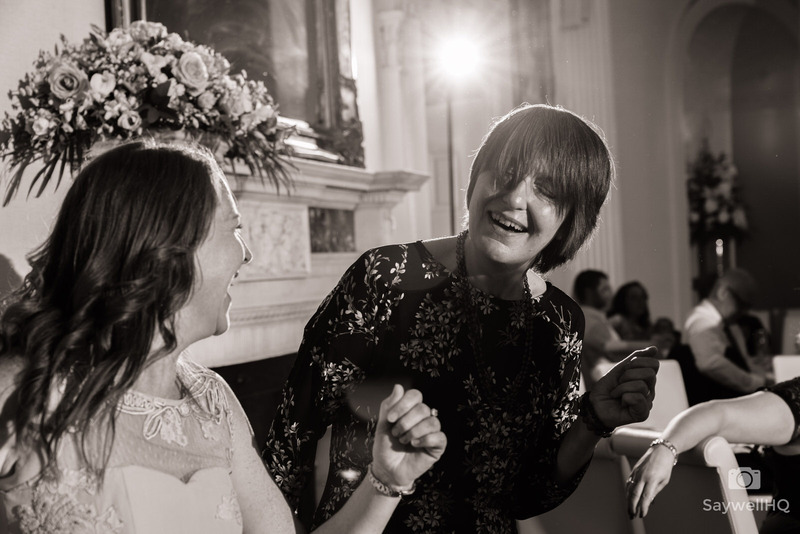 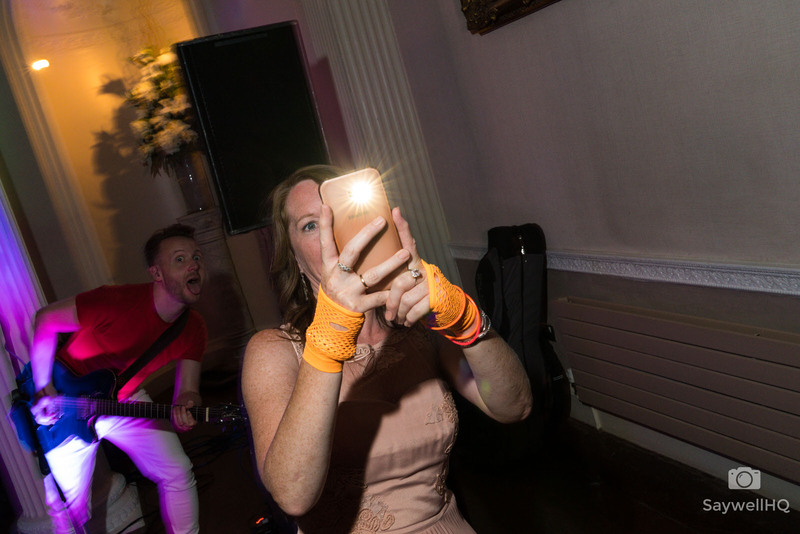 Rachel absolutely loves her 80’s music and had booked a live band to play all the classic 80’s hits and as soon as the band started playing everybody was on the dancefloor busting some moves. 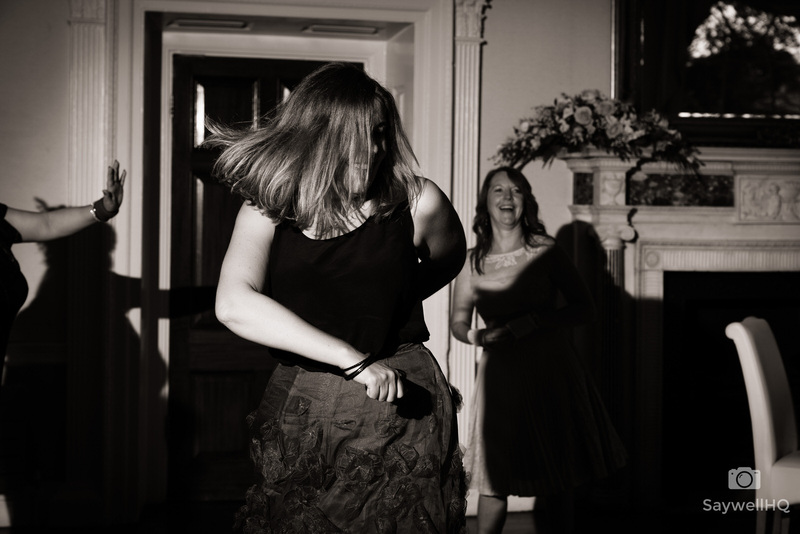 The disco part of a wedding is one of my favourite parts of the wedding day as by this point the alcohol has flowed and people have started to relax, and I think you can tell by some of the disco pictures that people were loving the 80’s live band and loving being part of Jerry and Rachel’s special day. 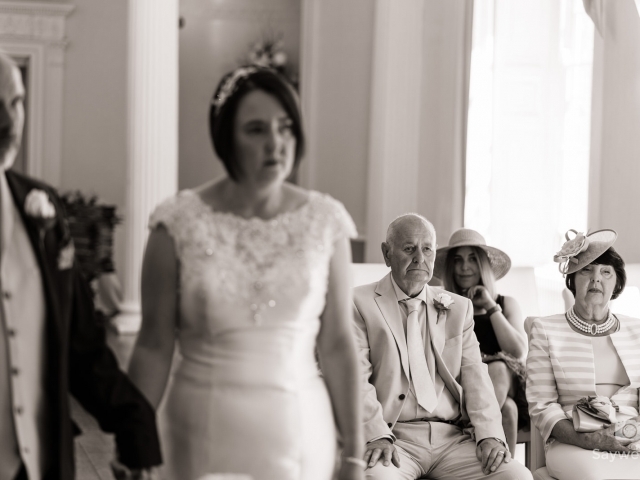 Jerry and Rachel have some wonderful family and friends and it’s no surprise that everybody loved the day, congratulations guys and thank you for letting me be a part of your wedding. 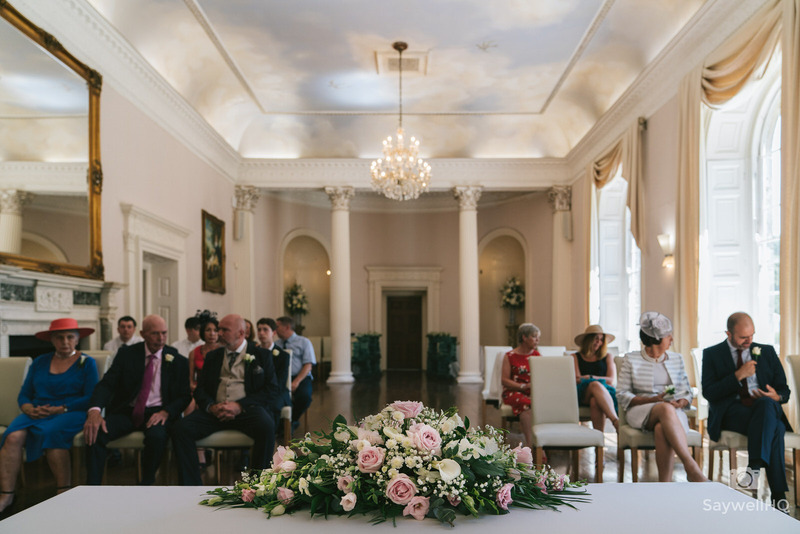 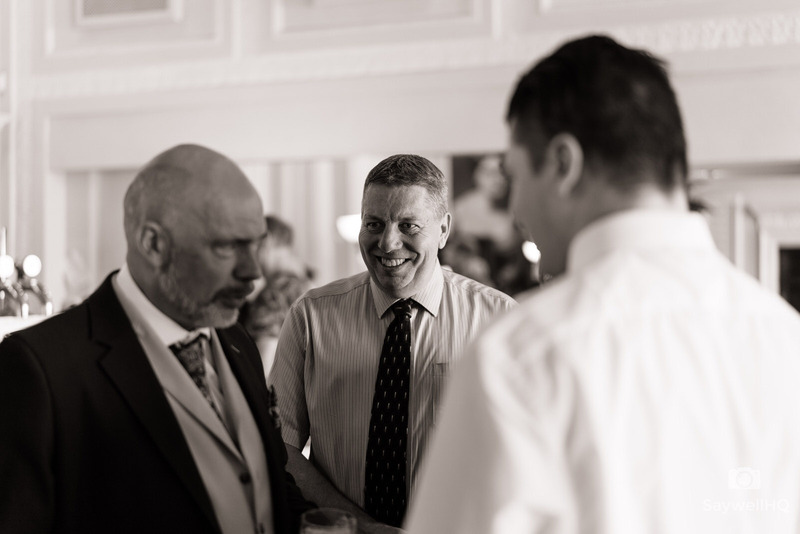 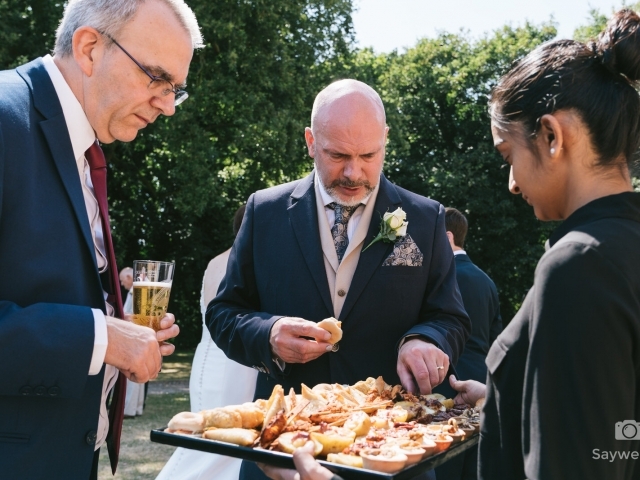 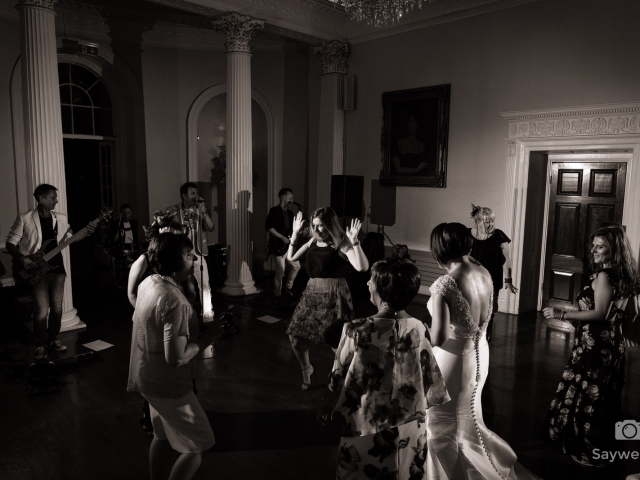 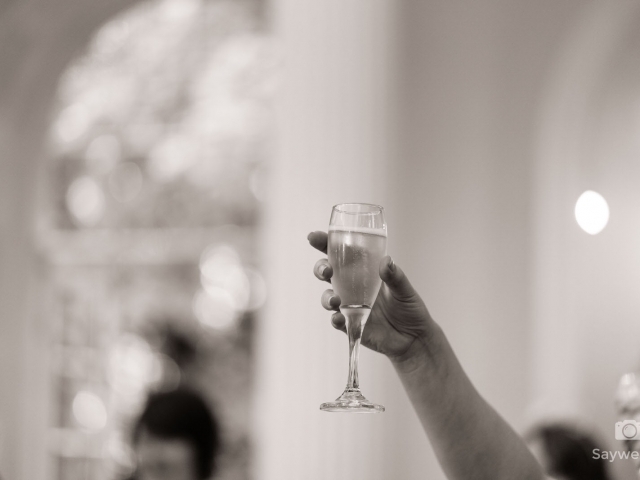 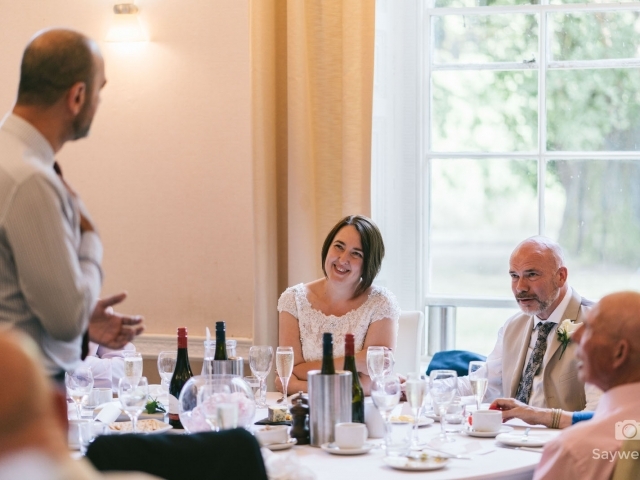 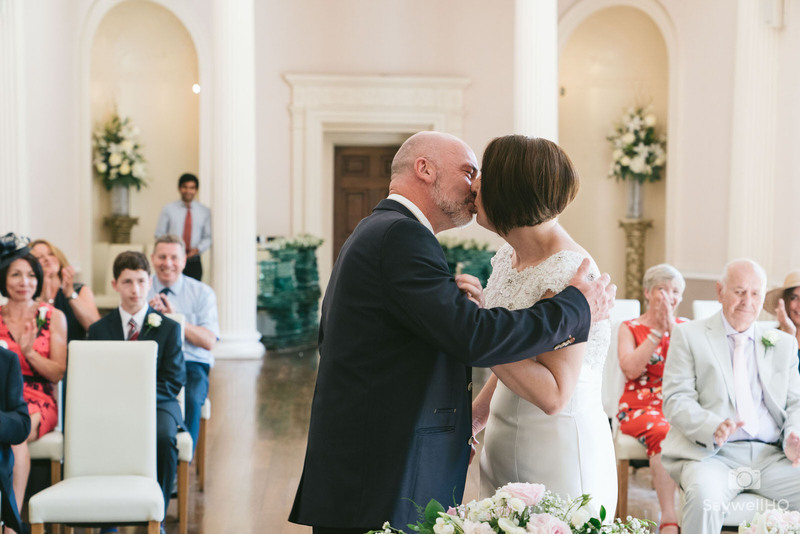 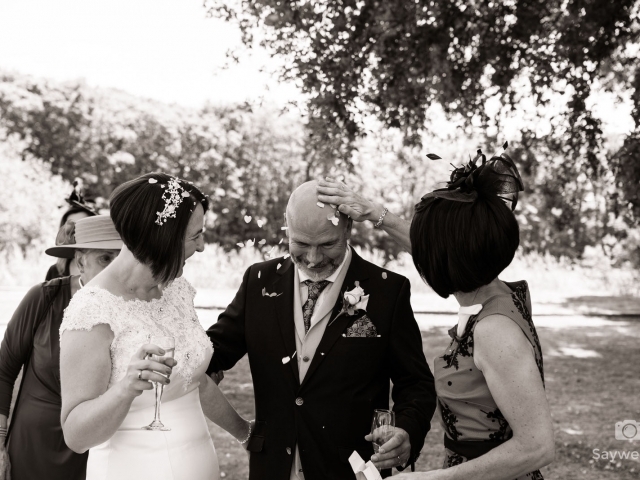 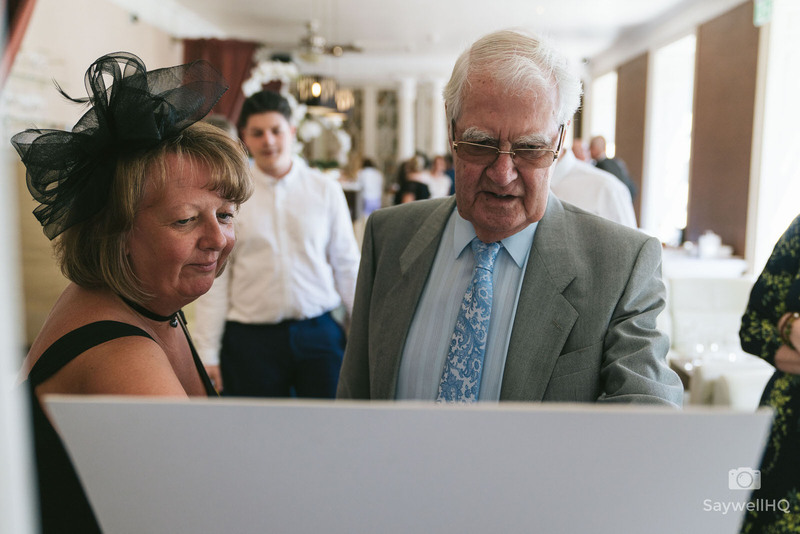 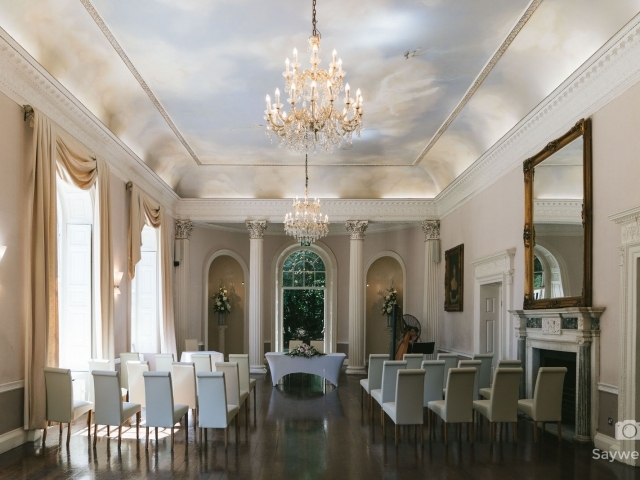 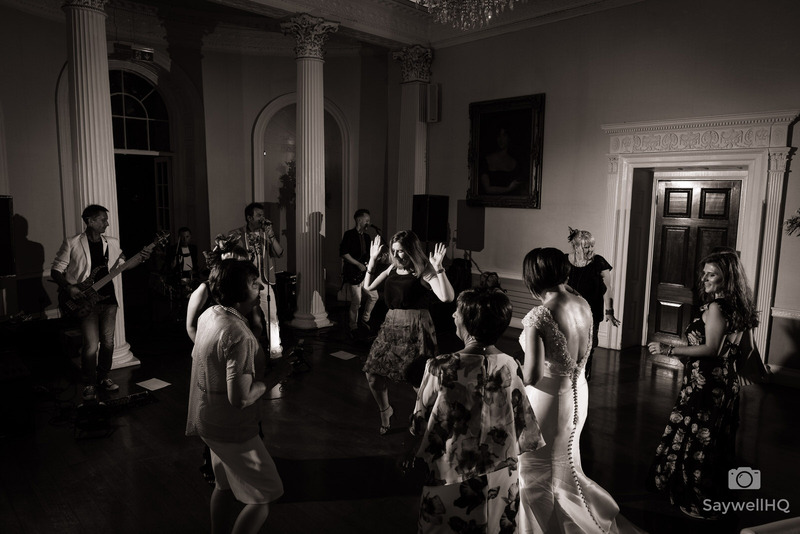 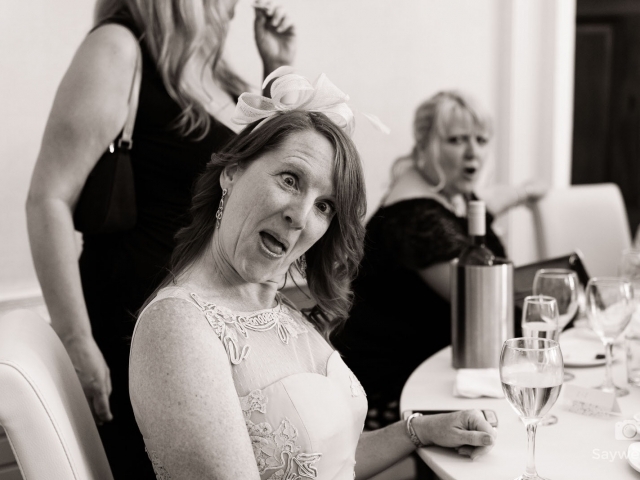 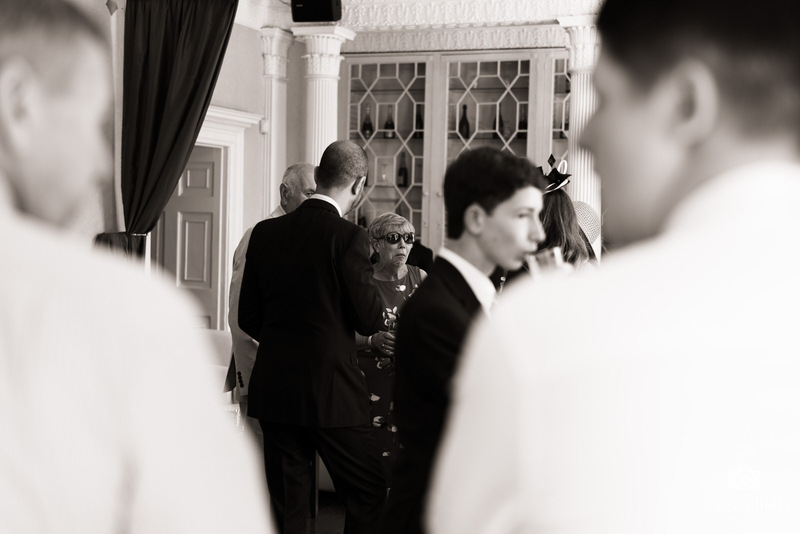 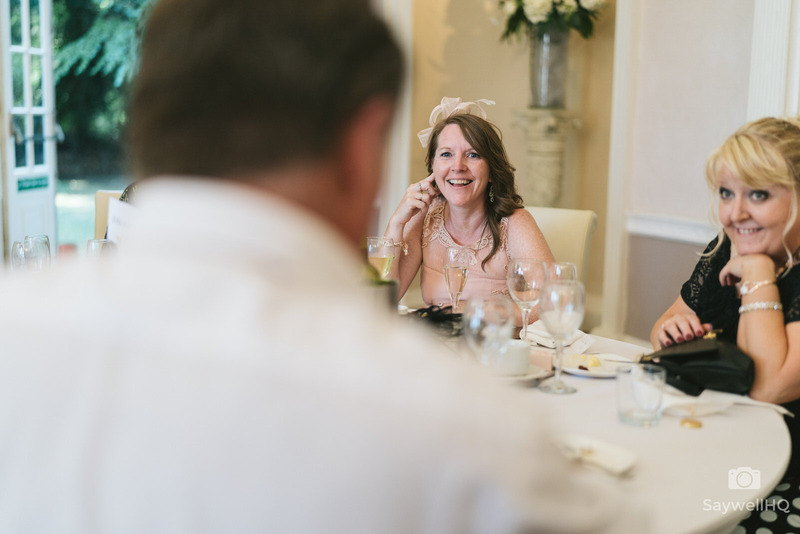 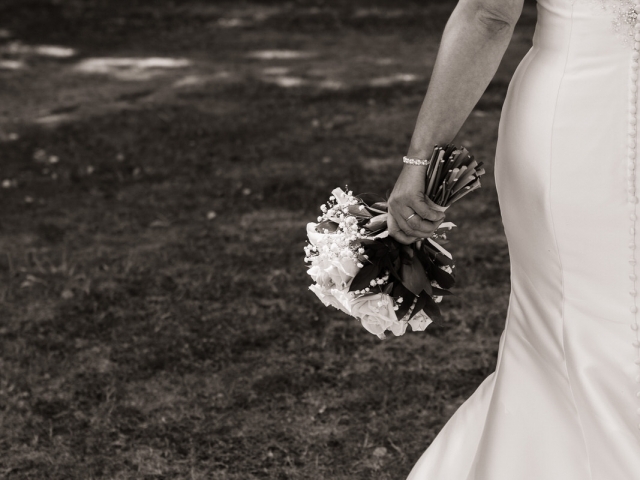 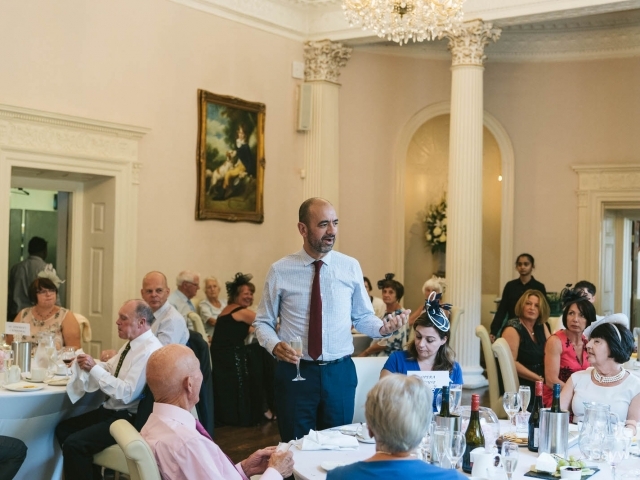 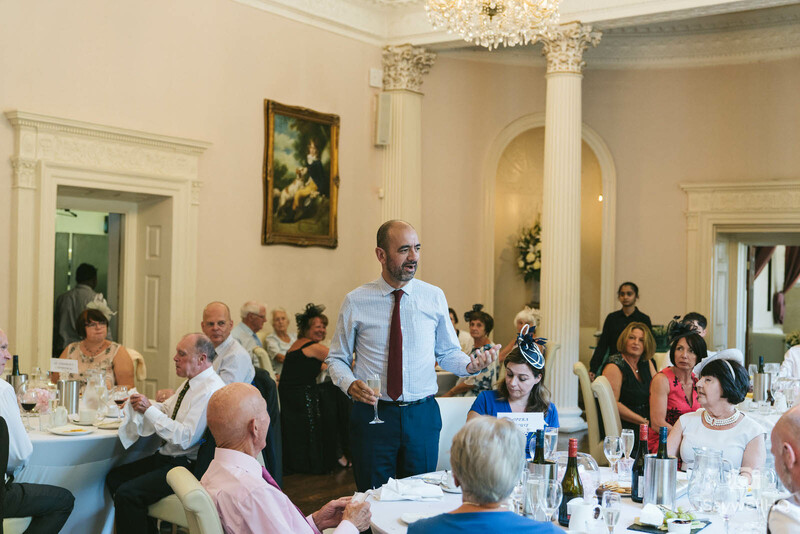 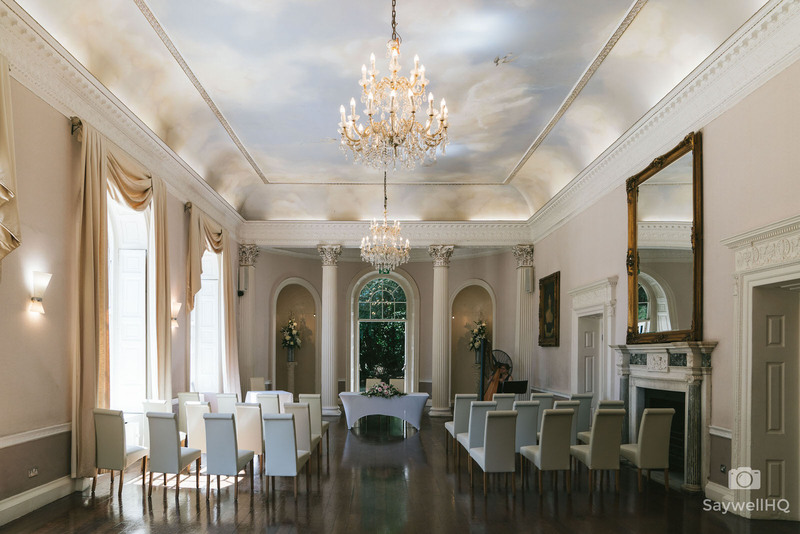 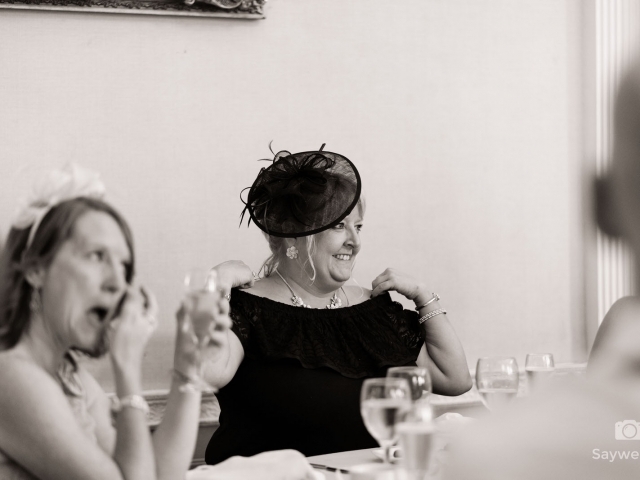 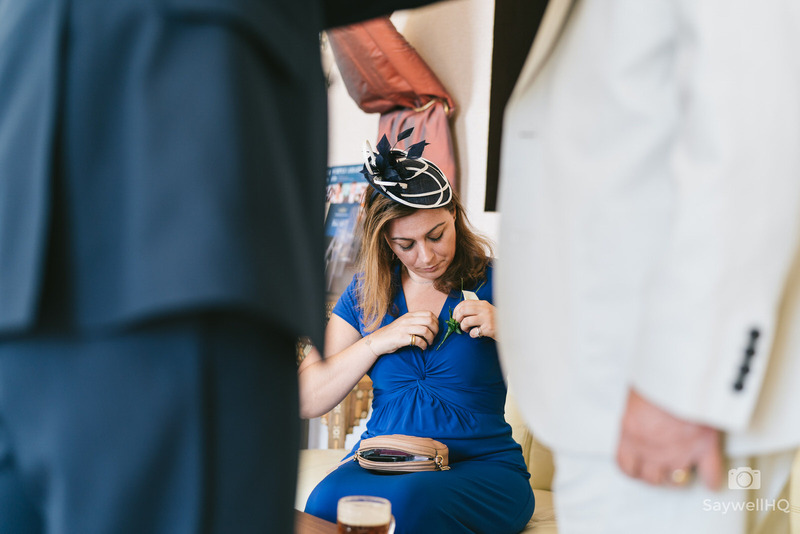 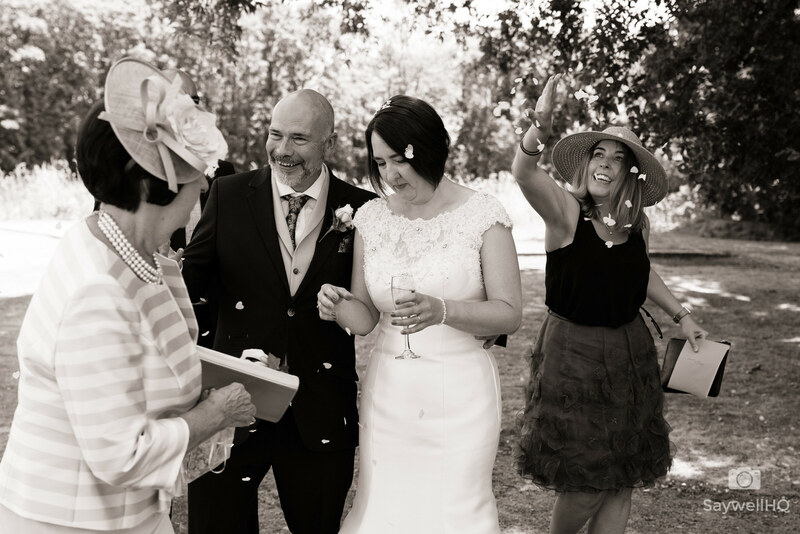 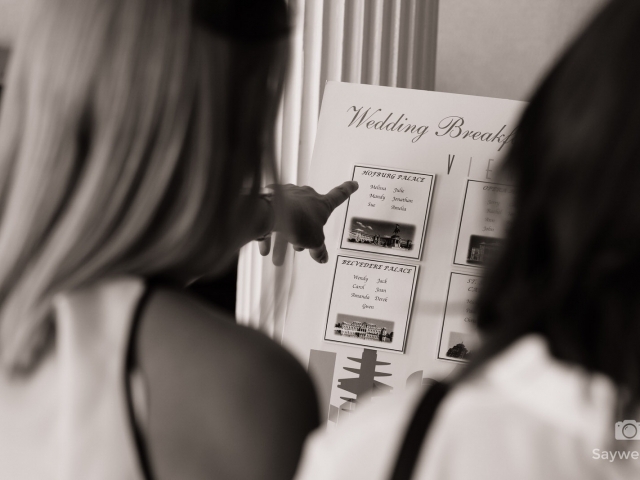 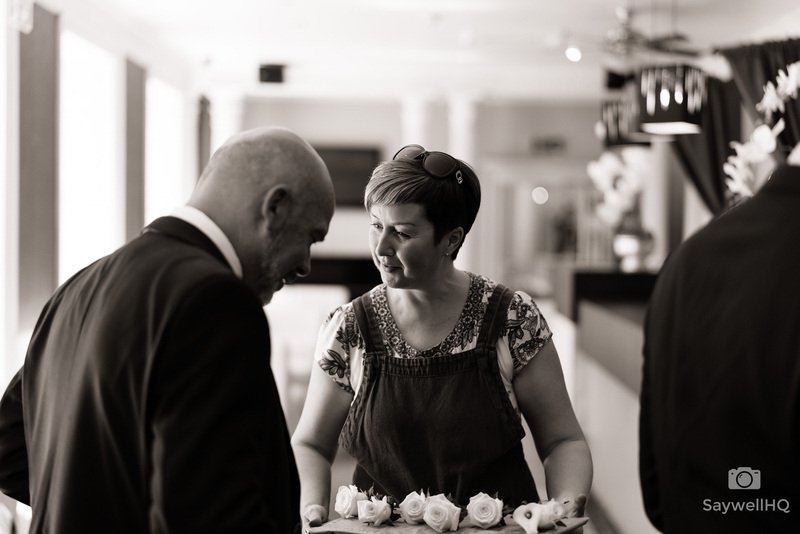 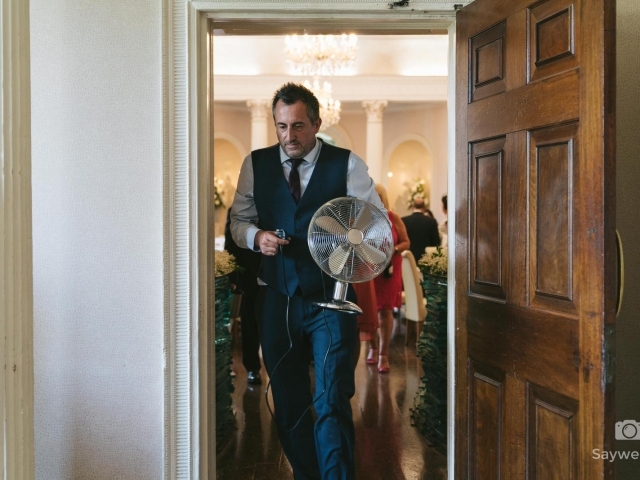 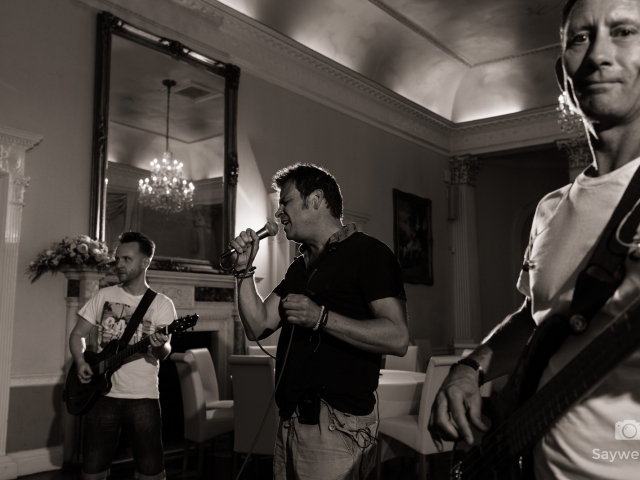 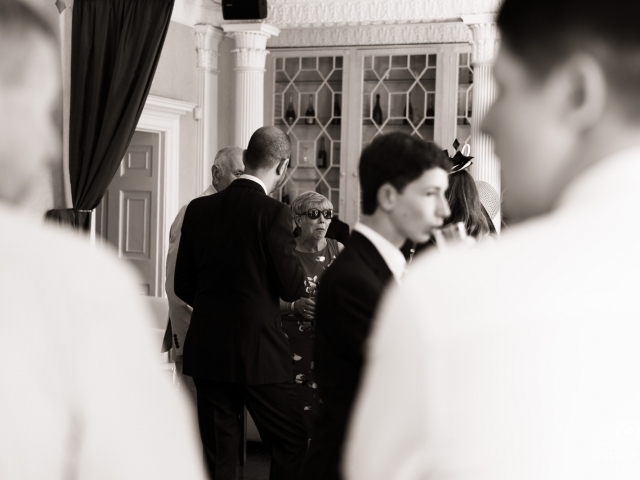 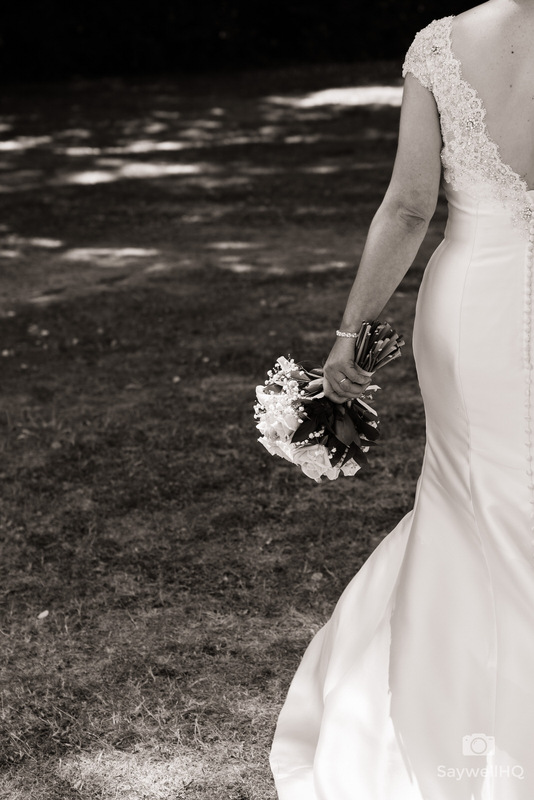 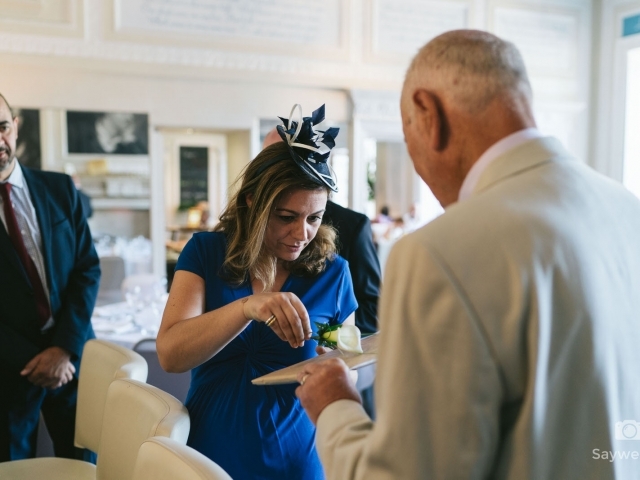 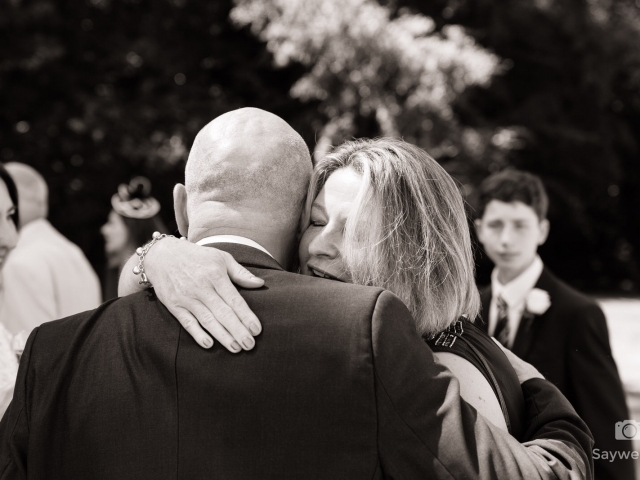 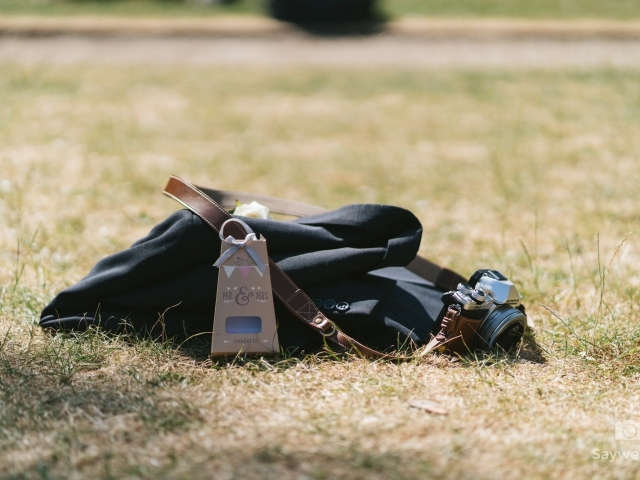 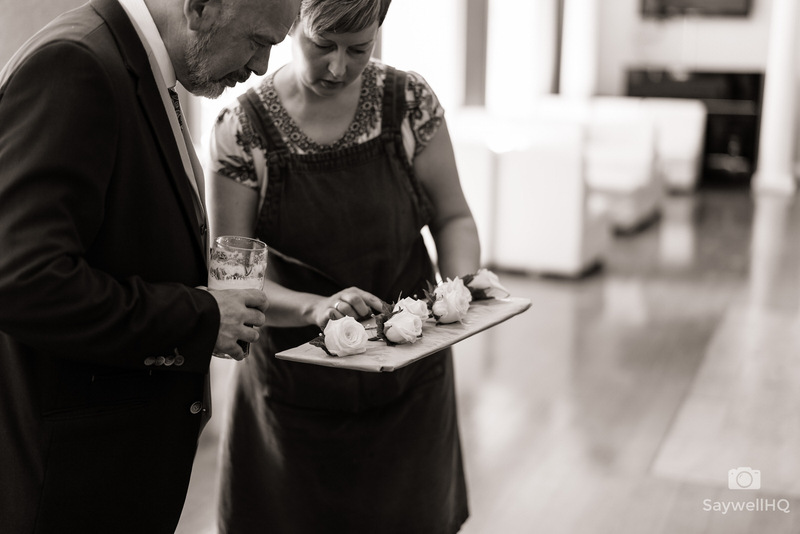 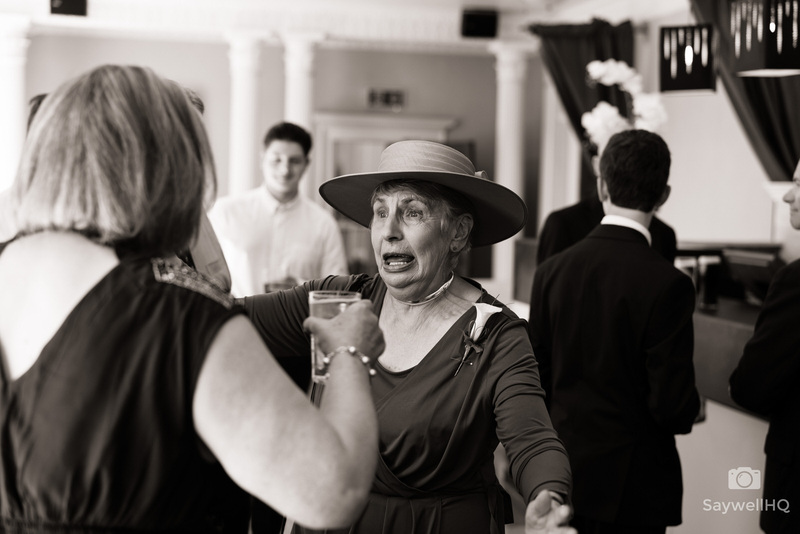 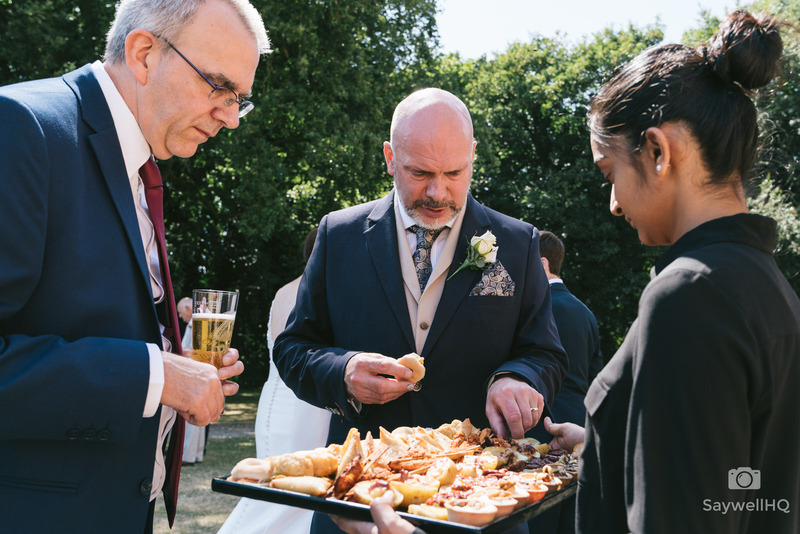 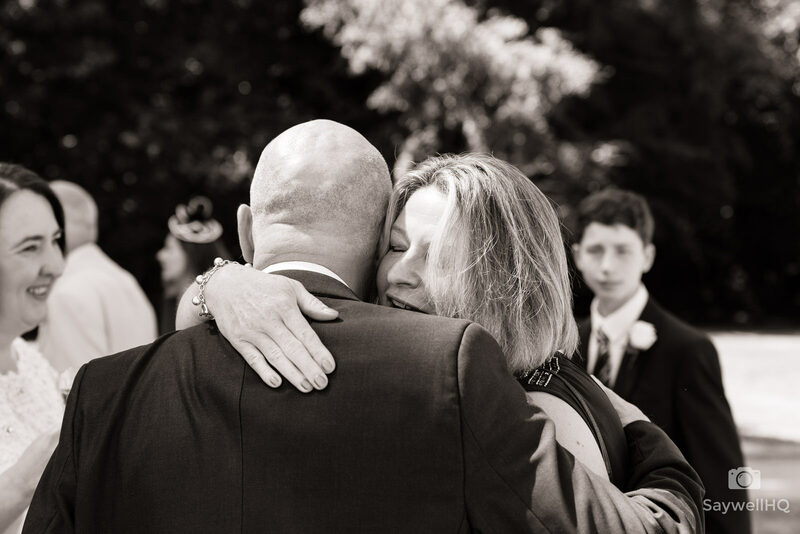 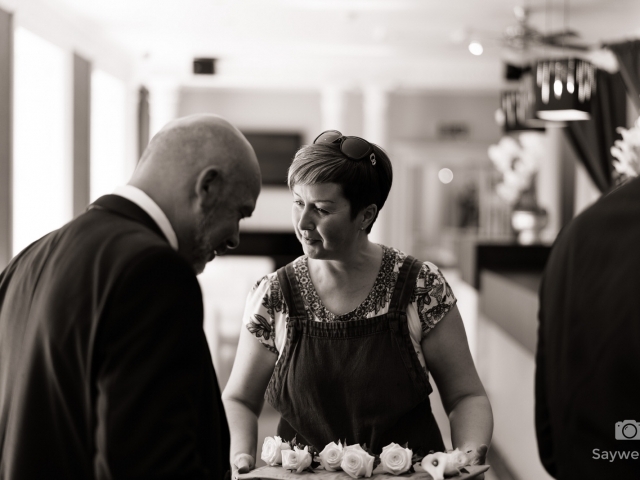 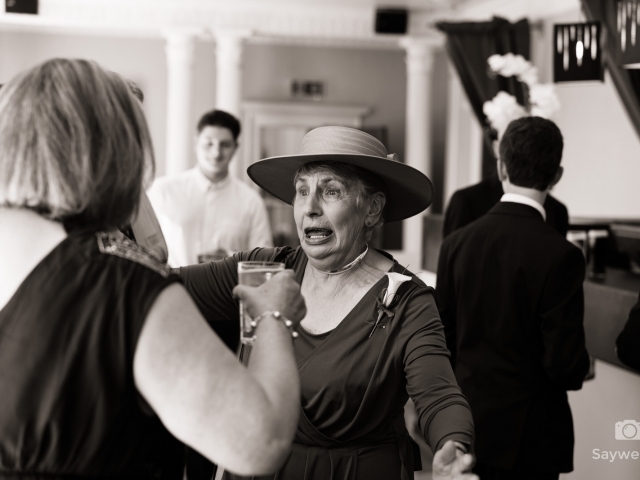 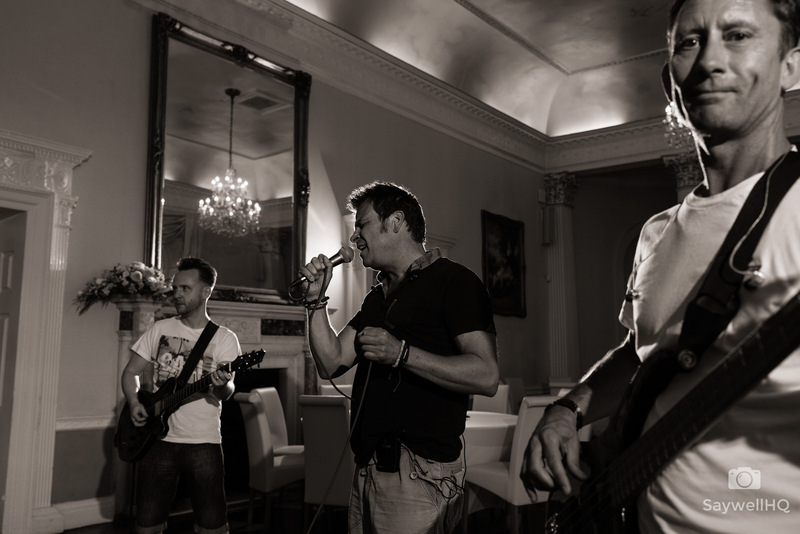 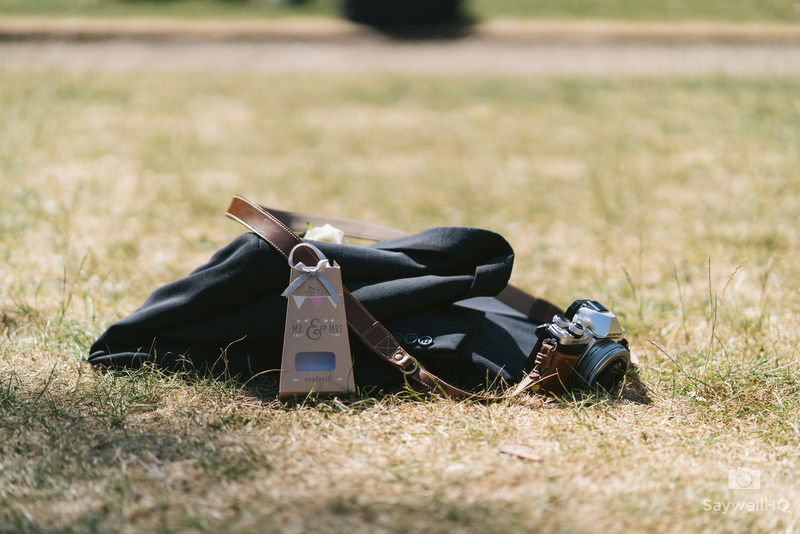 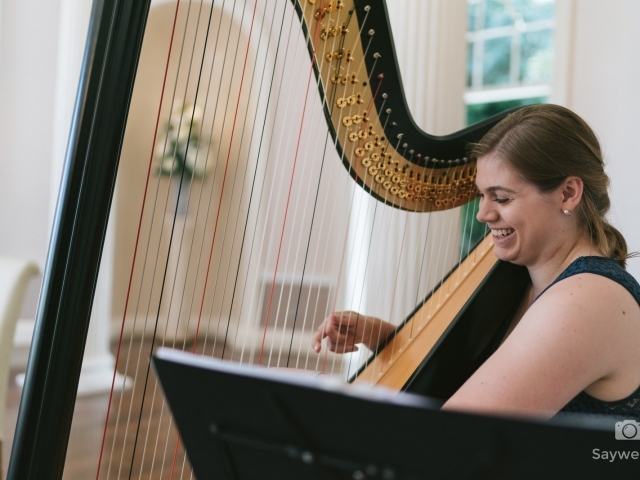 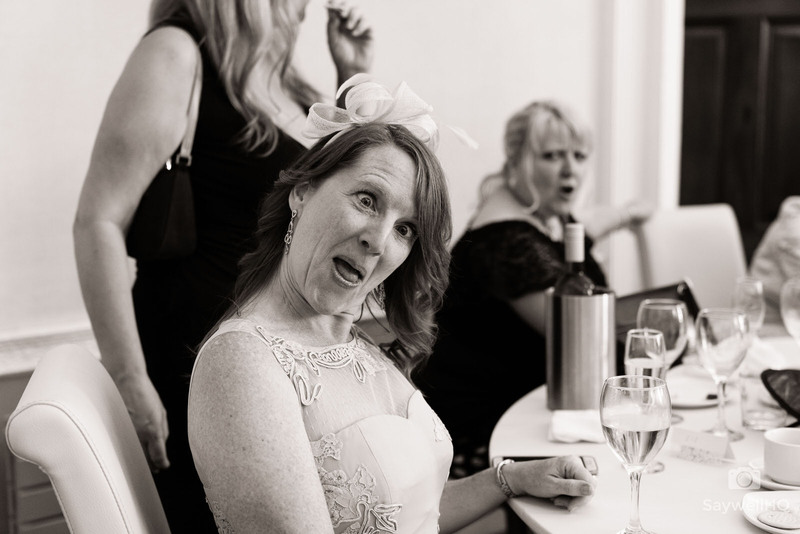 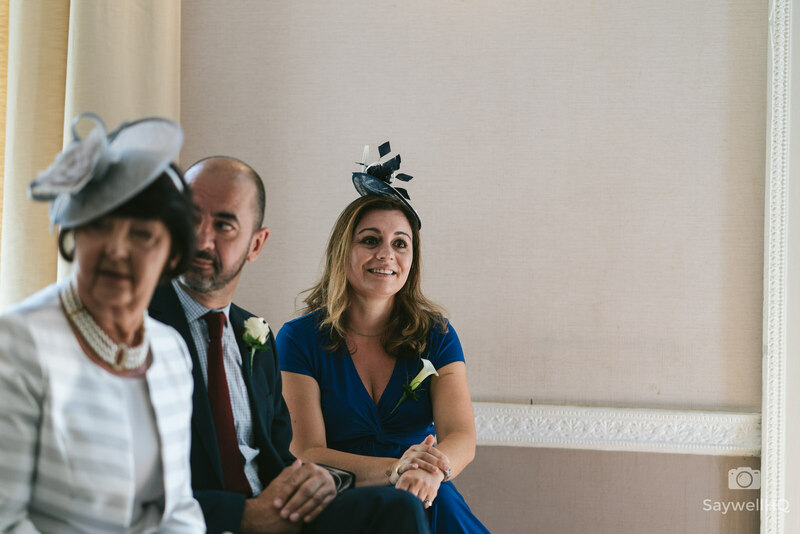 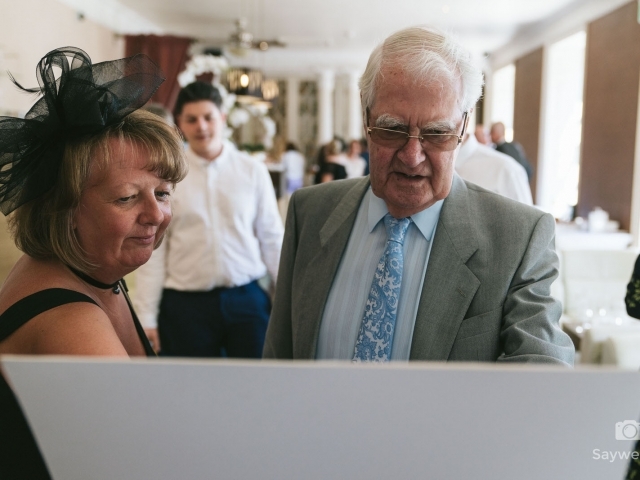 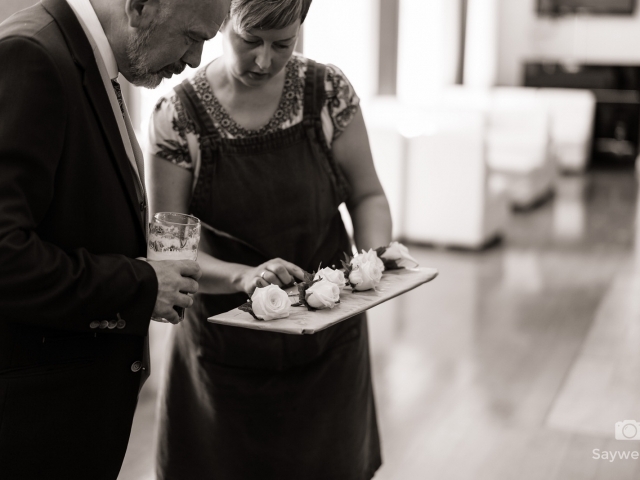 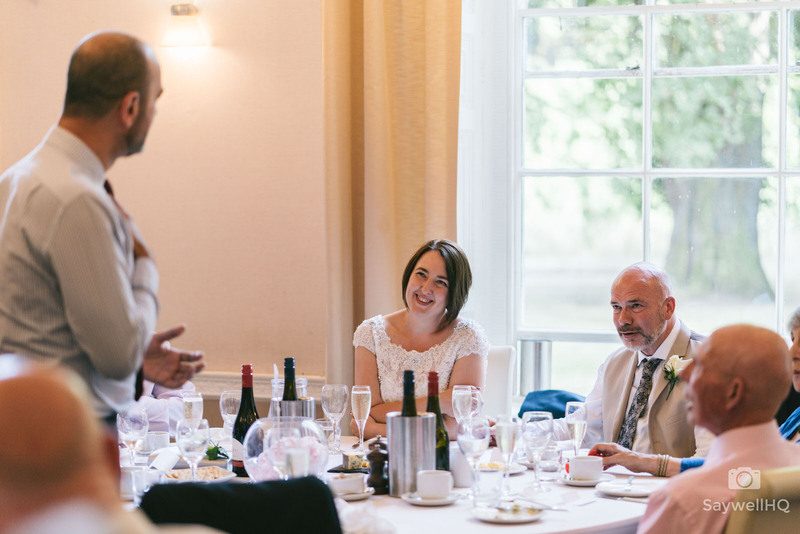 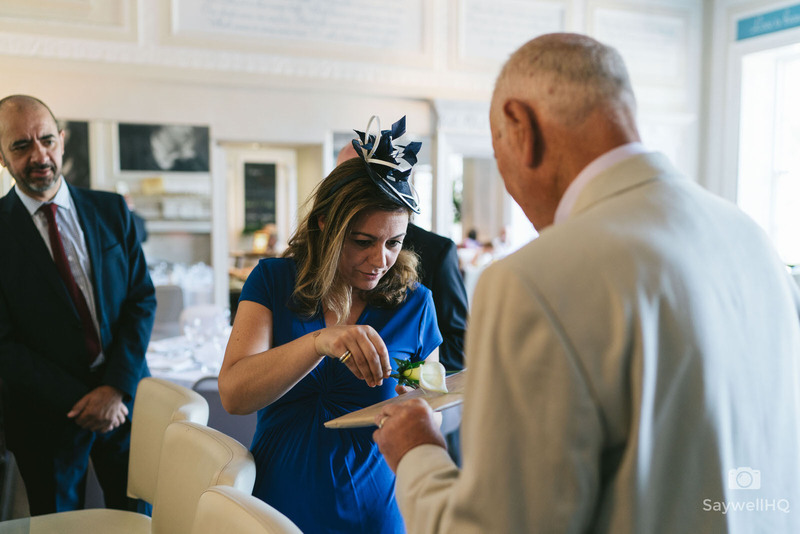 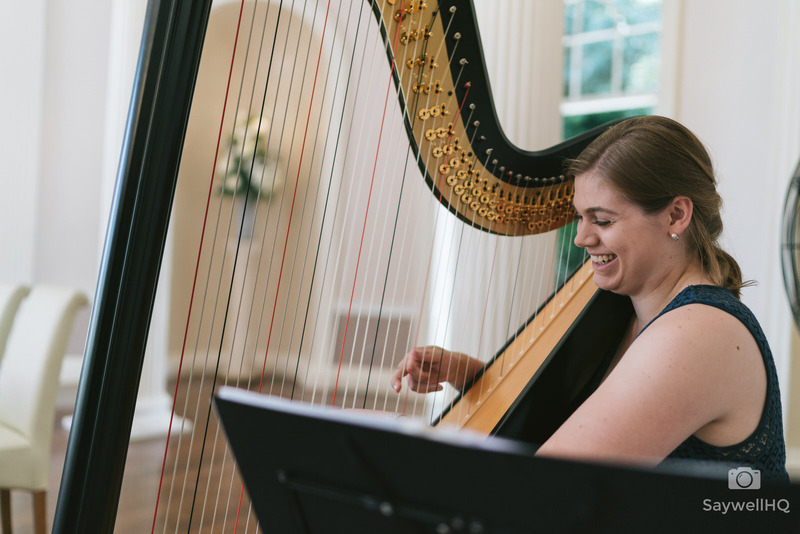 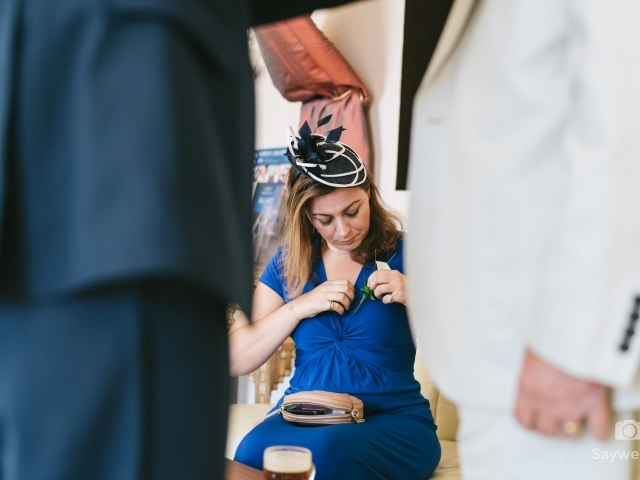 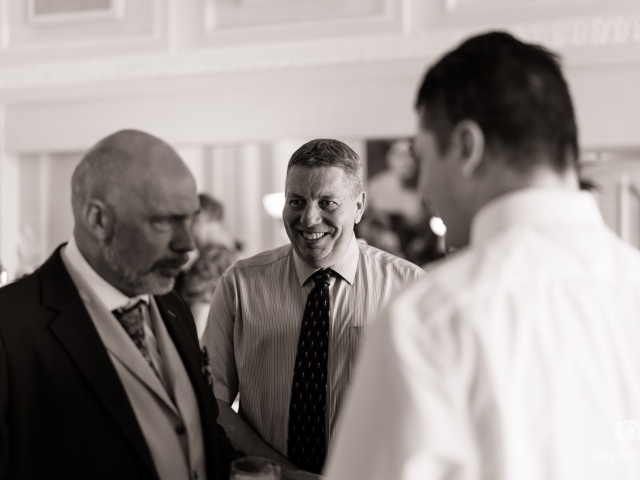 “SaywellHQ is the perfect choice for a relaxed wedding. 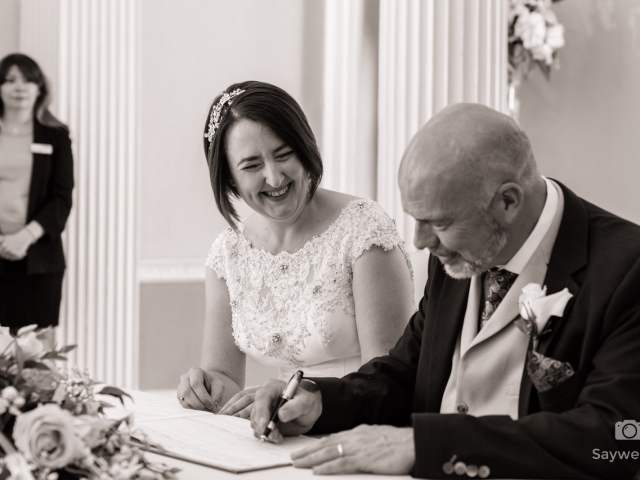 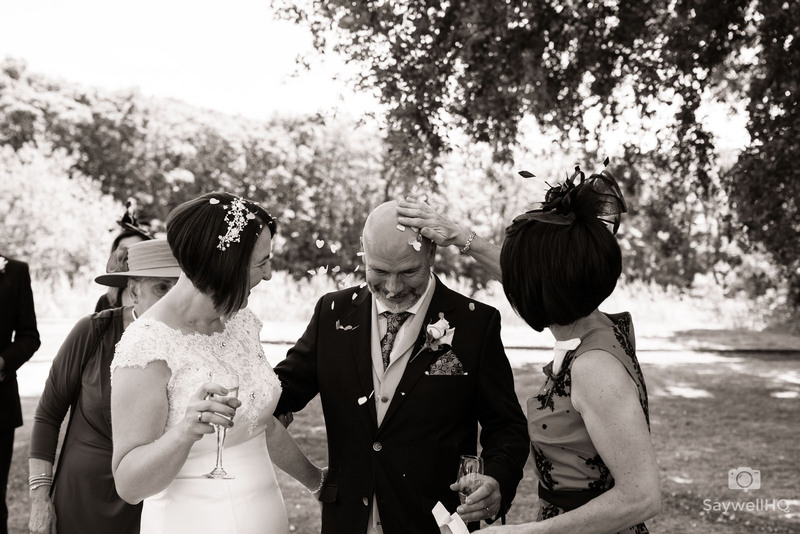 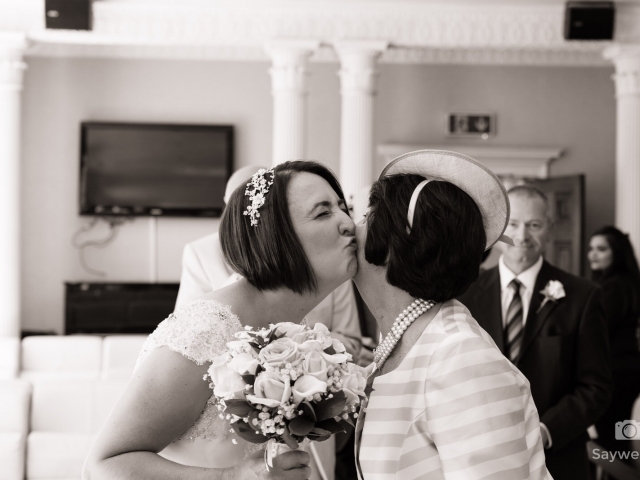 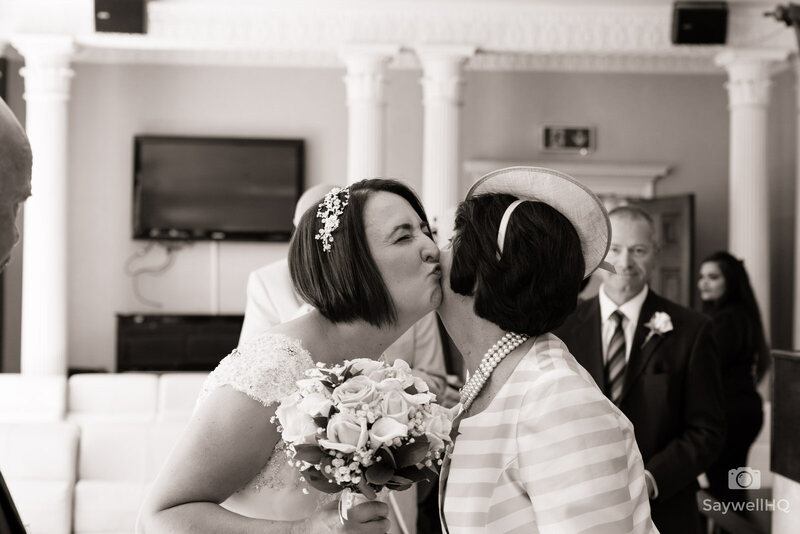 We’d like to thank Andy for taking such fantastic photographs – they captured the day perfectly. 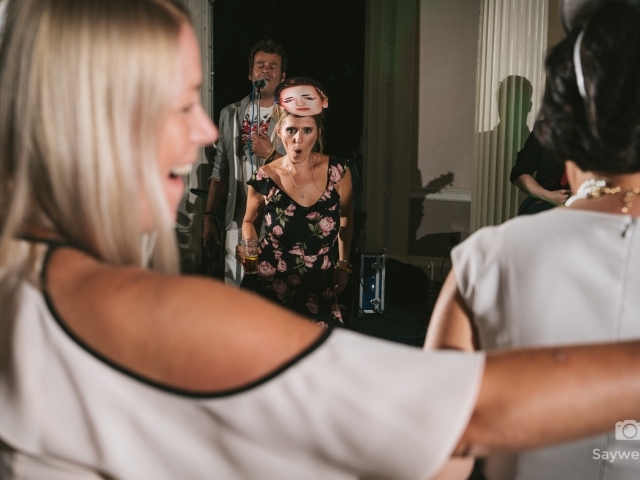 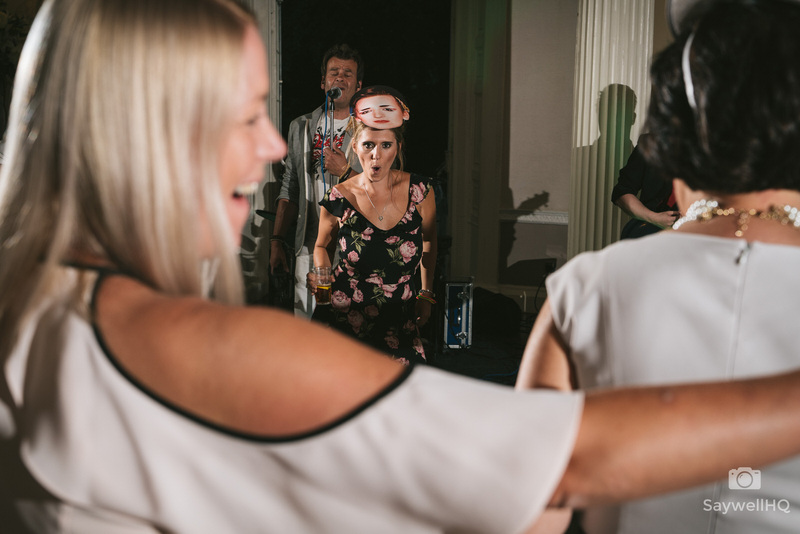 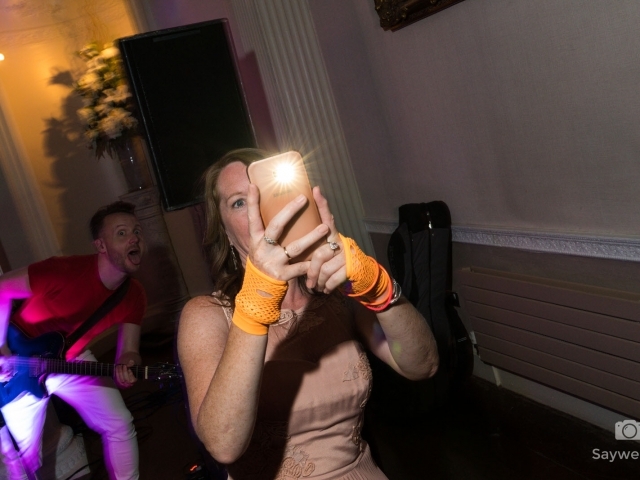 From the very start where the guests were arriving, all the way through to the evening 80s band, the action shots really showed how much everyone enjoyed the moment. 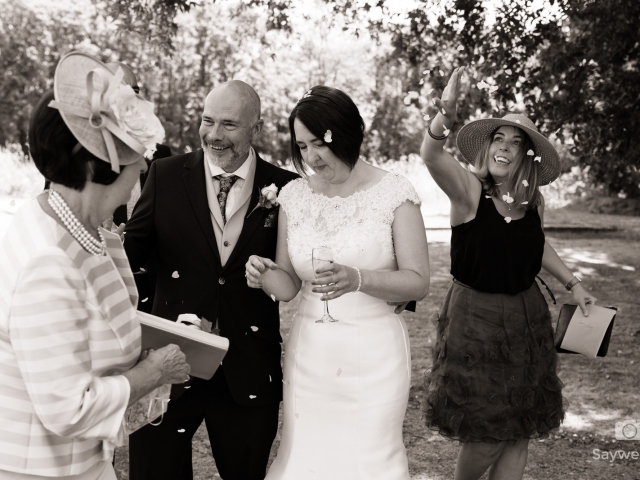 We love the way they tell the story of the wedding and how natural they all are .. 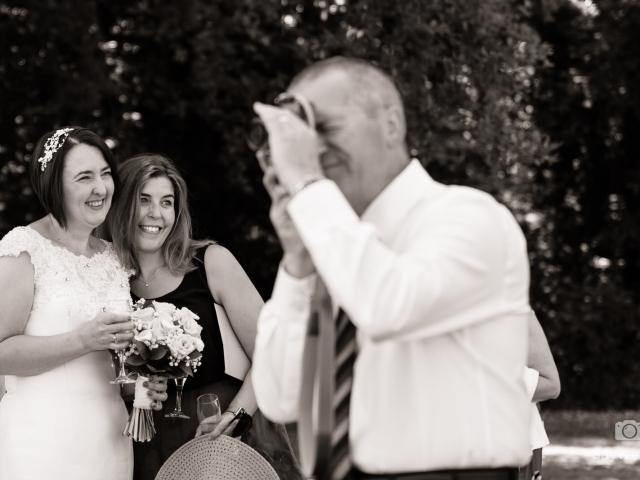 I even have my eyes open on all the pictures, which is a first. 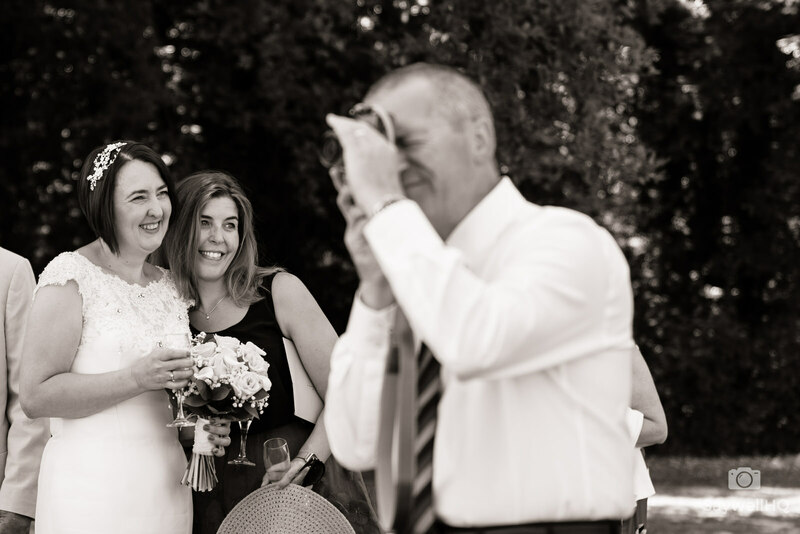 No photographer has ever managed that! 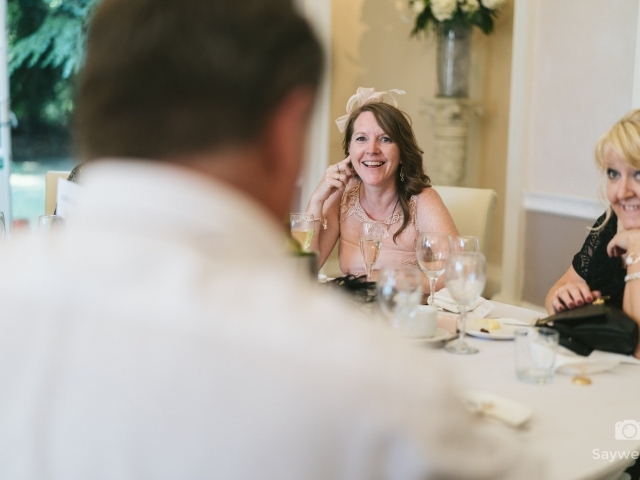 Being the Bride and Groom, we spent most of the day chatting and laughing with friends and family, so missed a lot of the action which Andy took – he saw all that we missed and a lot more. 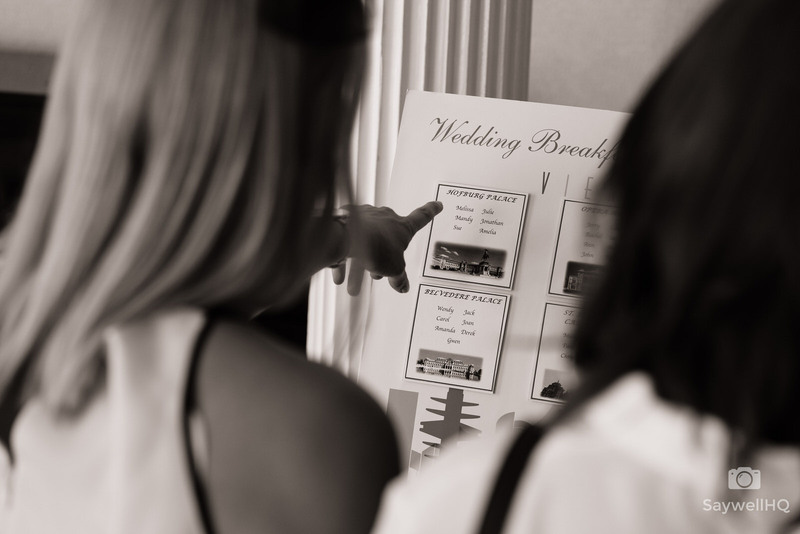 Friends and family we’ve shown the photos to are really impressed and comment on how natural everyone looks. 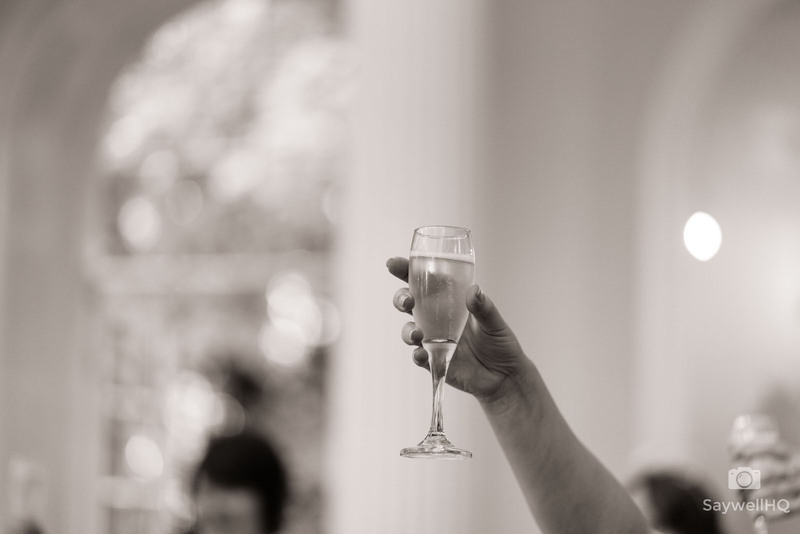 Thanks for putting everyone at ease.